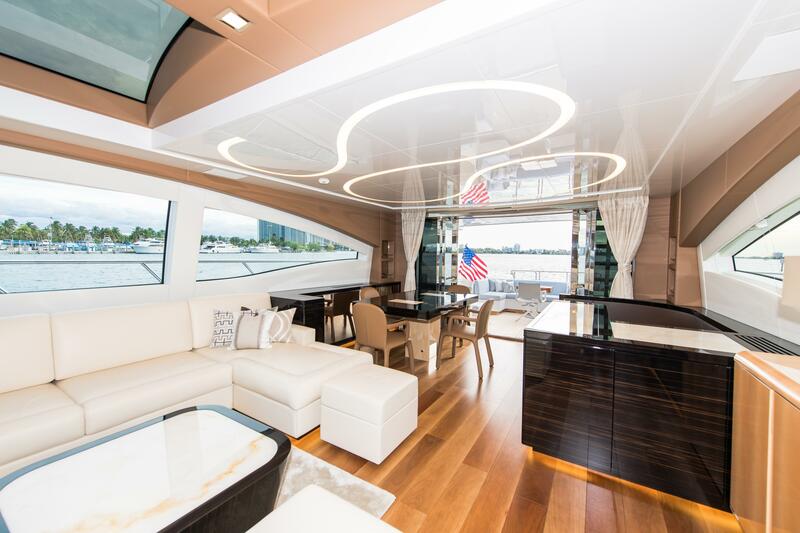 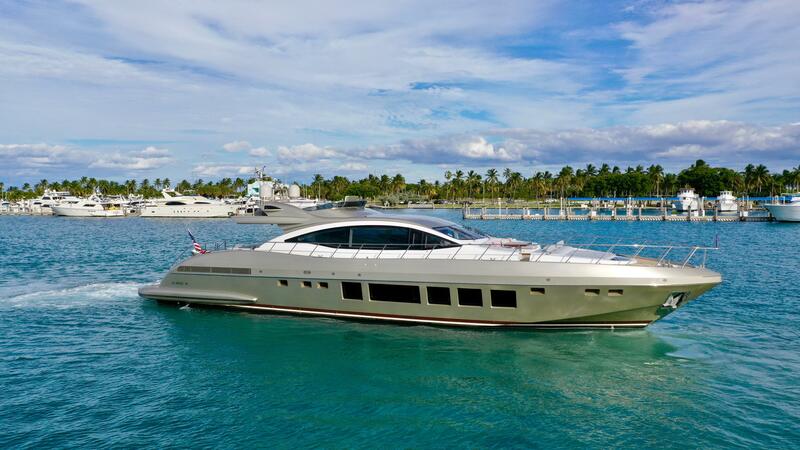 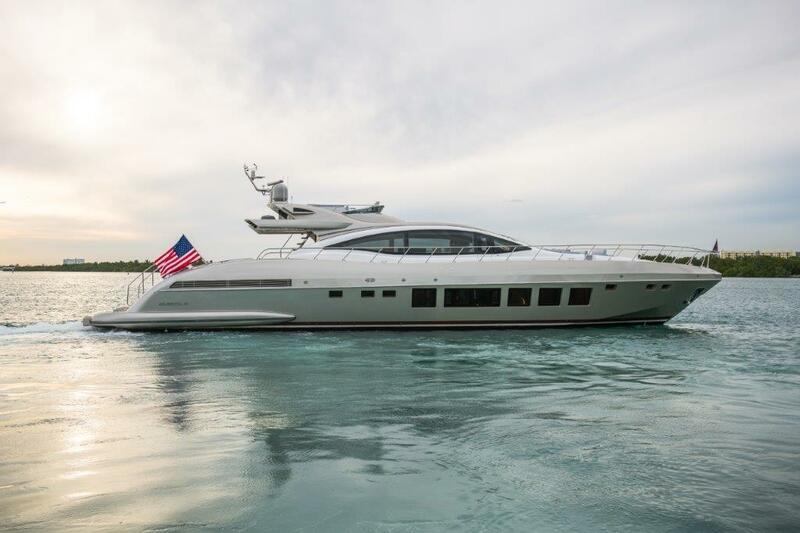 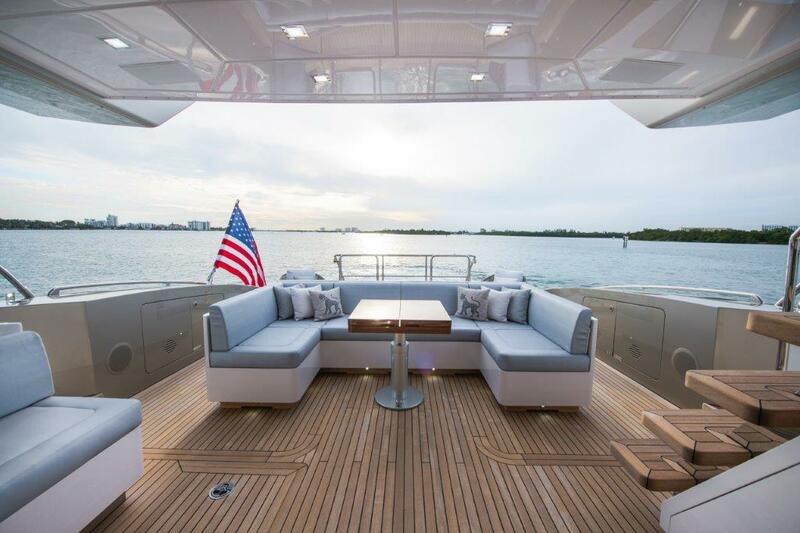 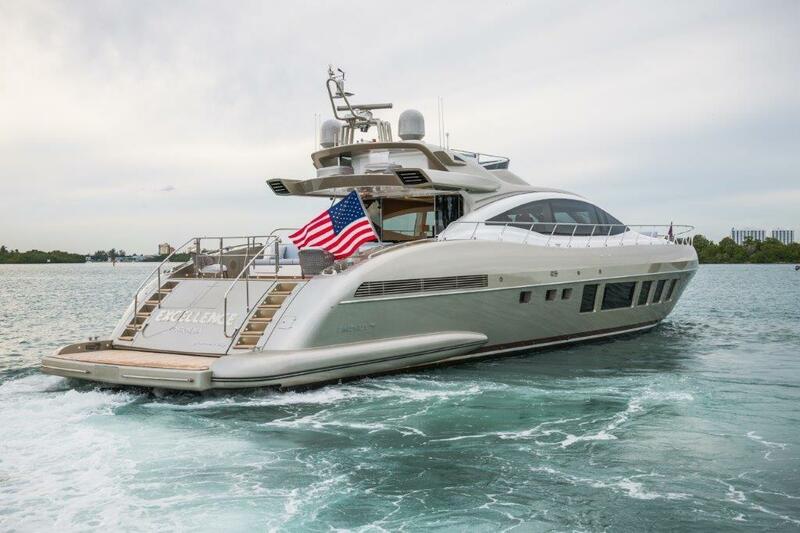 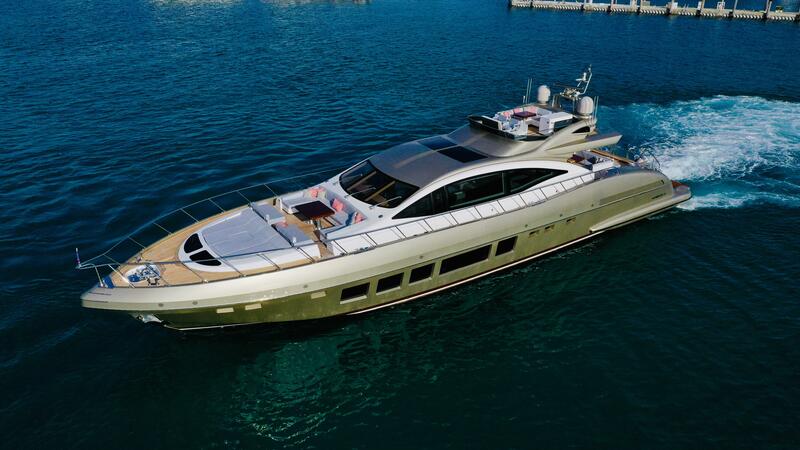 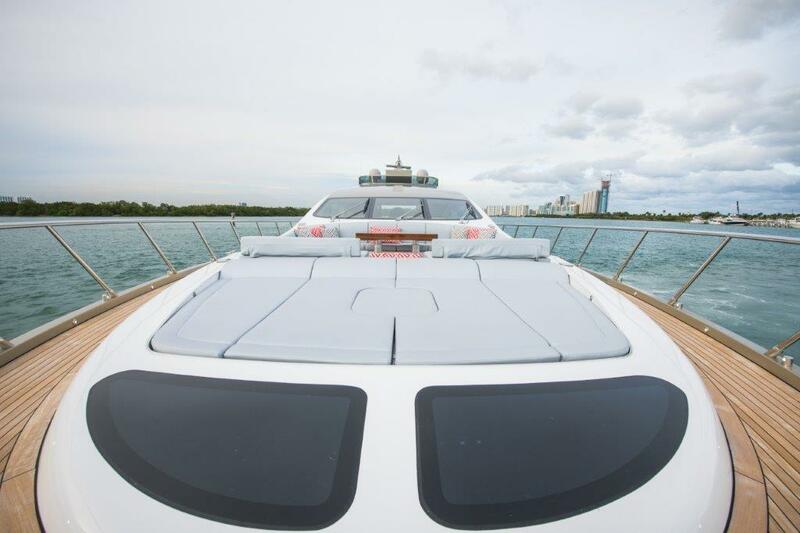 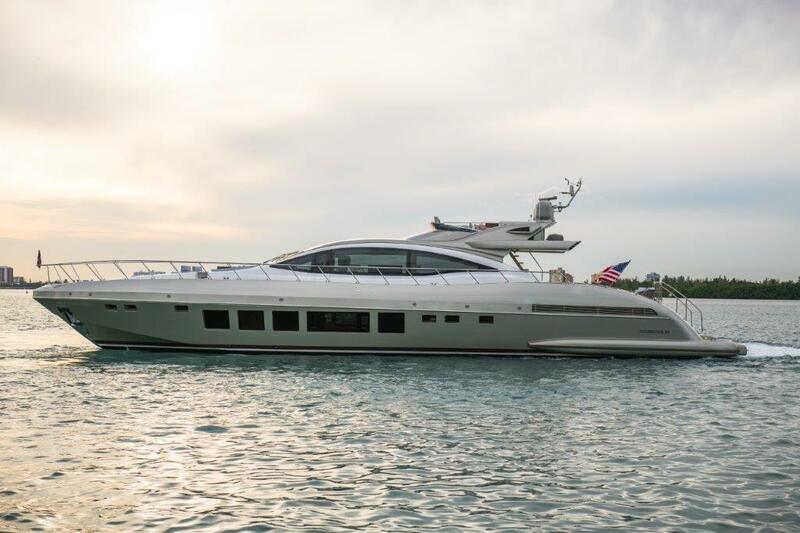 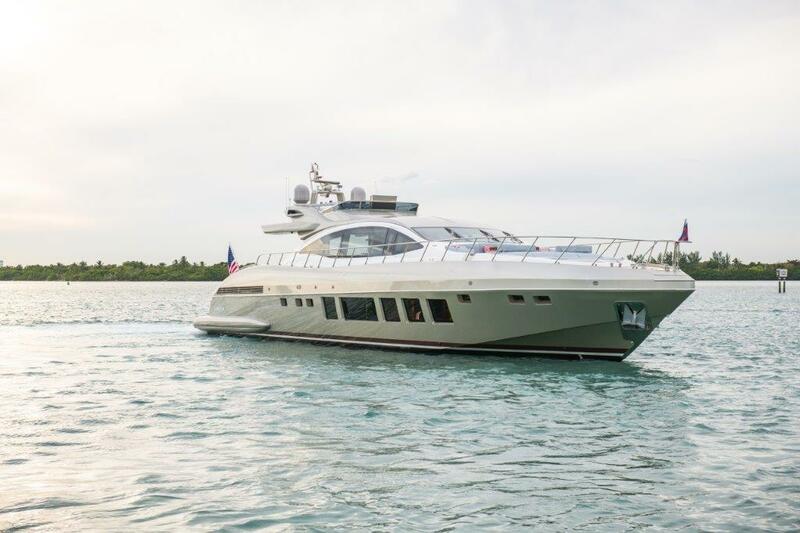 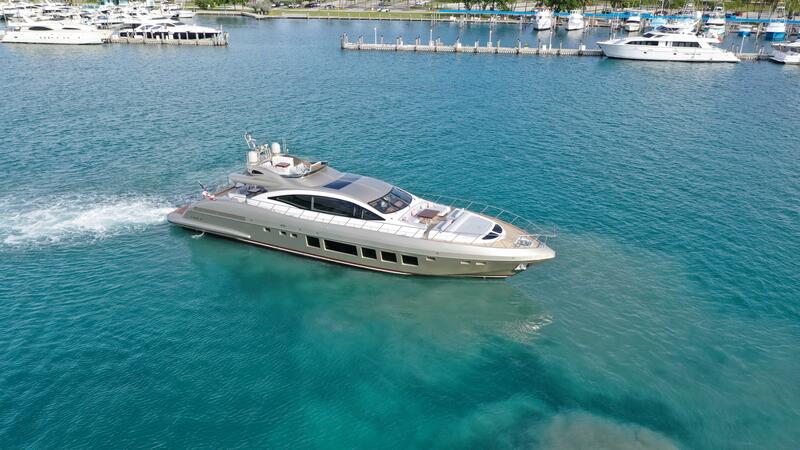 2019 Mangusta 94' Maxi Open "EXCELLENCE"
2019 MANGUSTA 94’ MAXI OPEN EXCELLENCE is the first 94’ MANGUSTA 94’ AMERICAN SPEC in the world, with MANGUSTA’s new masterful exterior window lines and a fully custom interior. 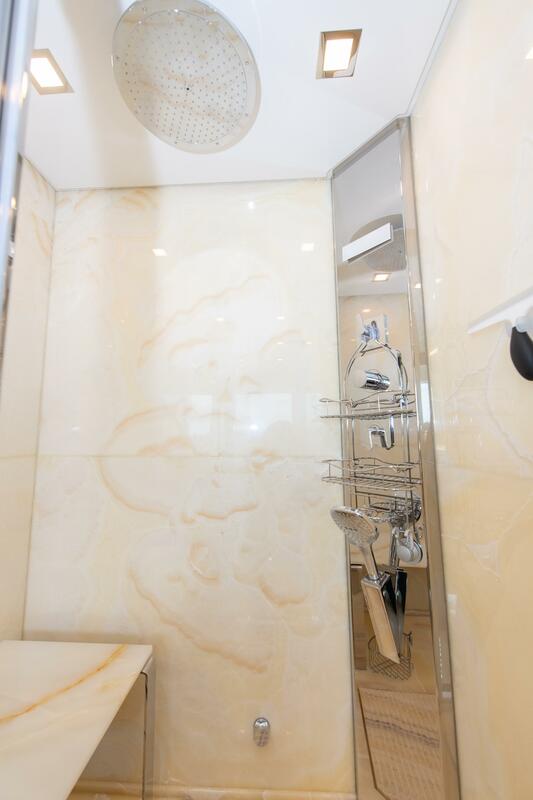 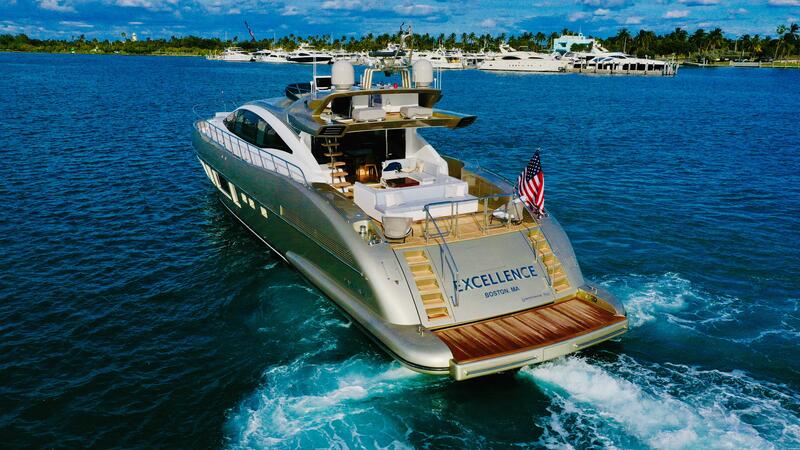 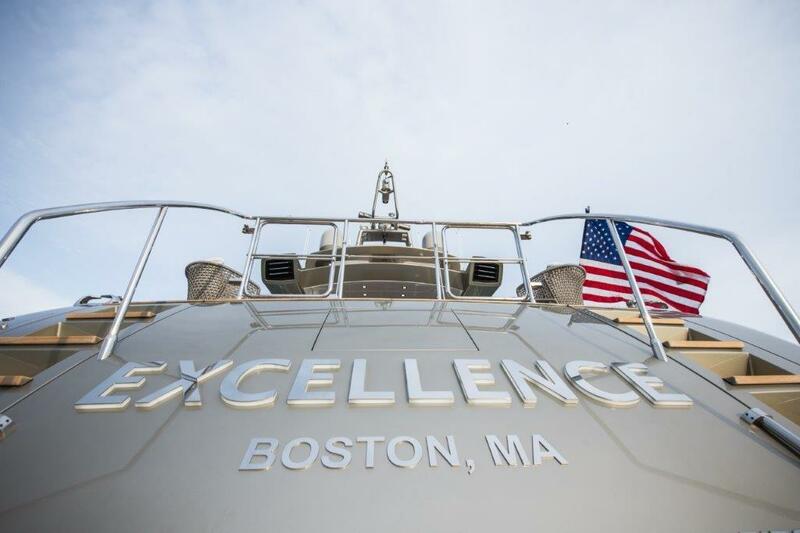 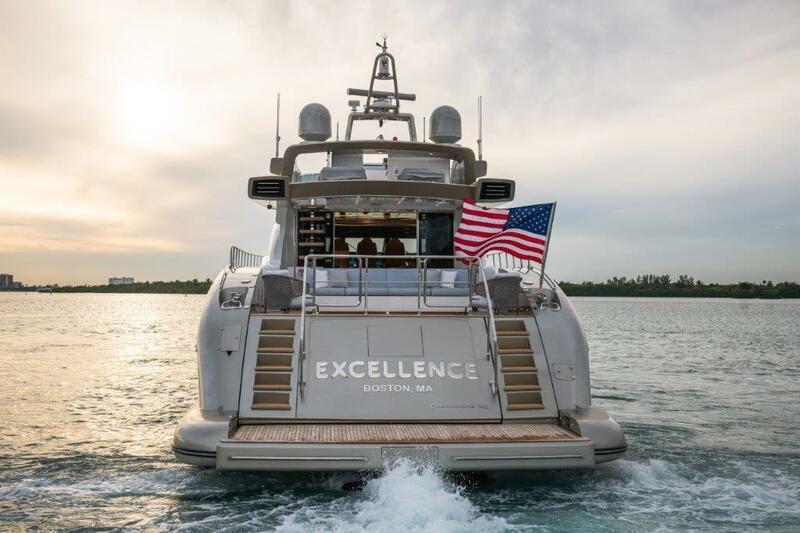 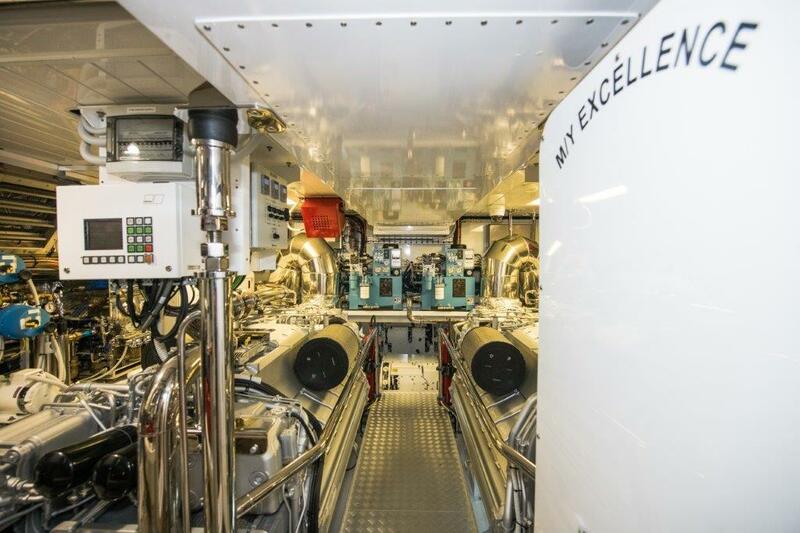 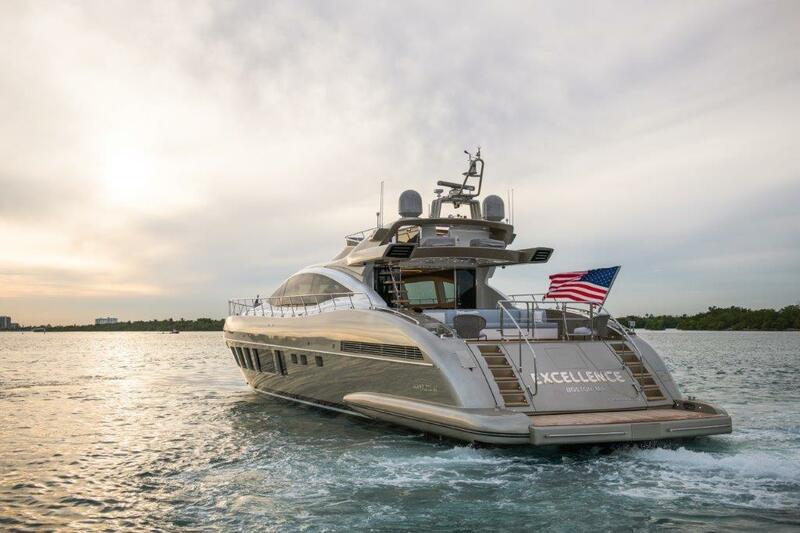 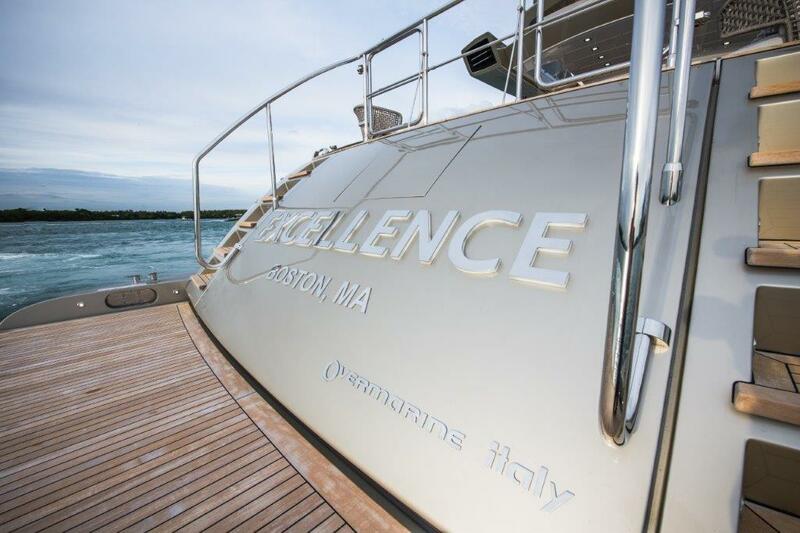 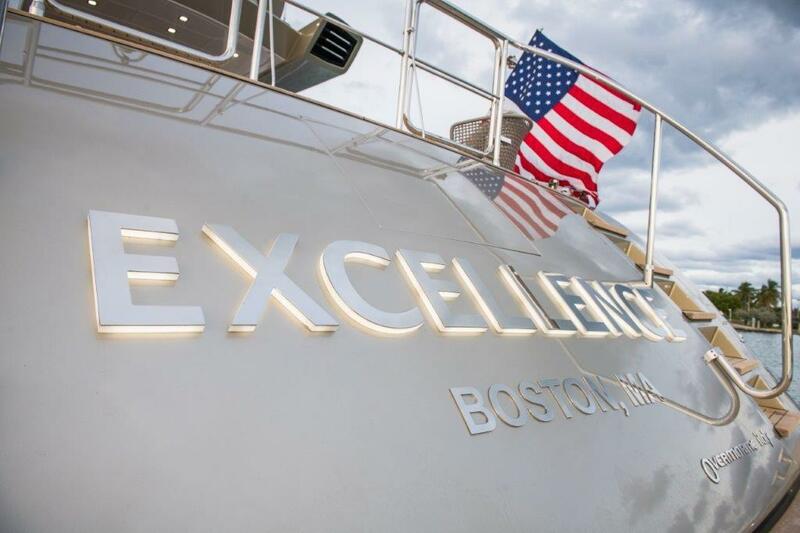 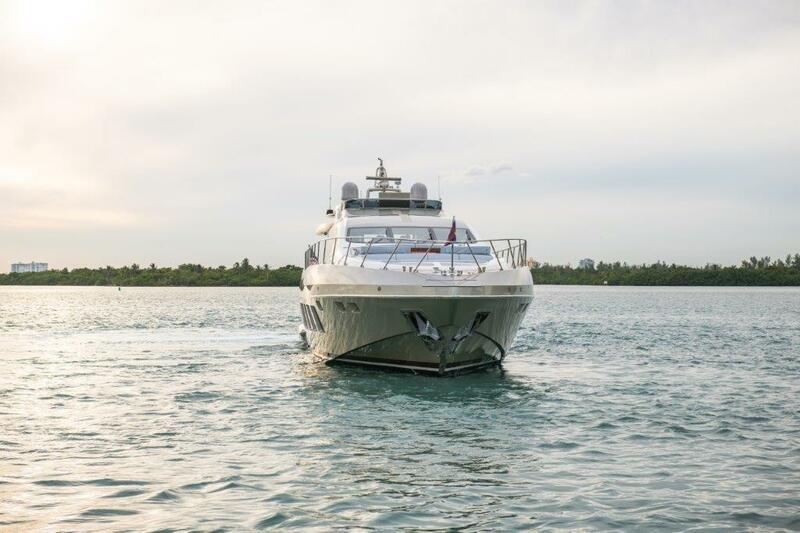 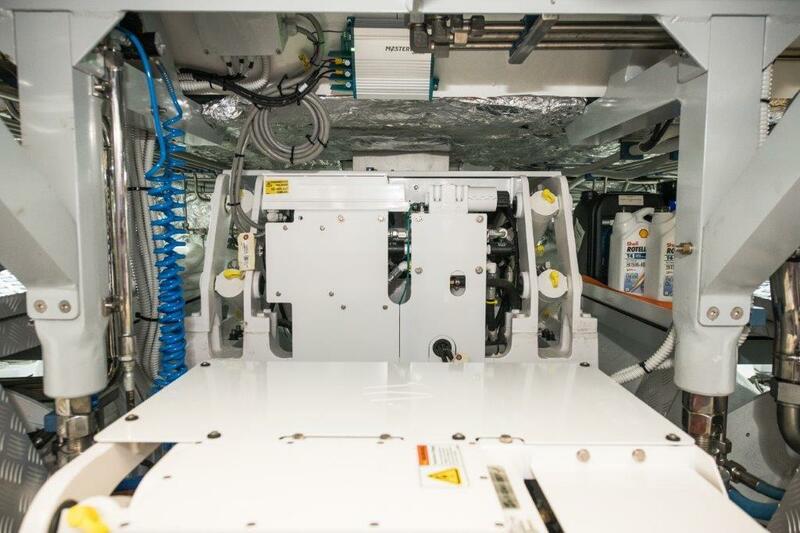 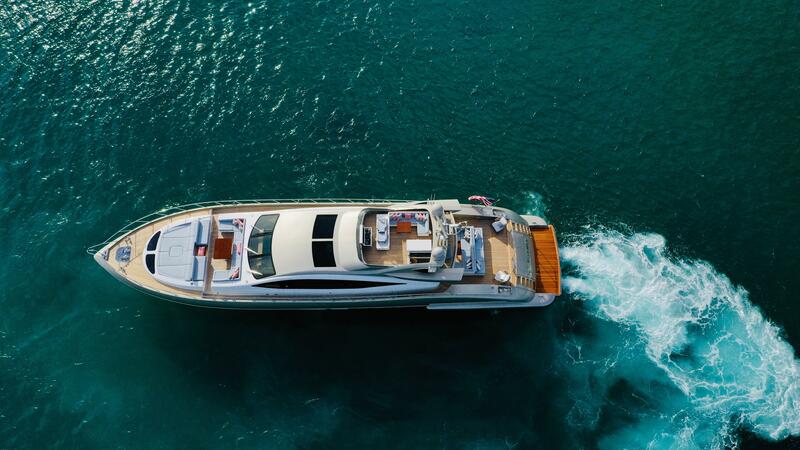 Designed by one of the most experienced and renowned yacht owners in the industry, you will quickly realize that the name EXCELLENCE defines this yacht, once you step on board. 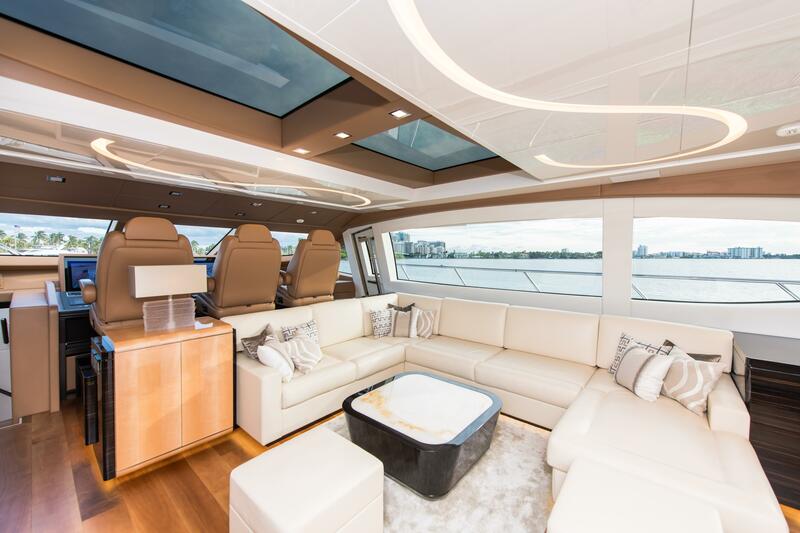 The layout of 2019 MANGUSTA 94’ EXCELLENCE, has been extremely well considered throughout, with spacious guest areas and deck spaces which manage to seamlessly flow together. 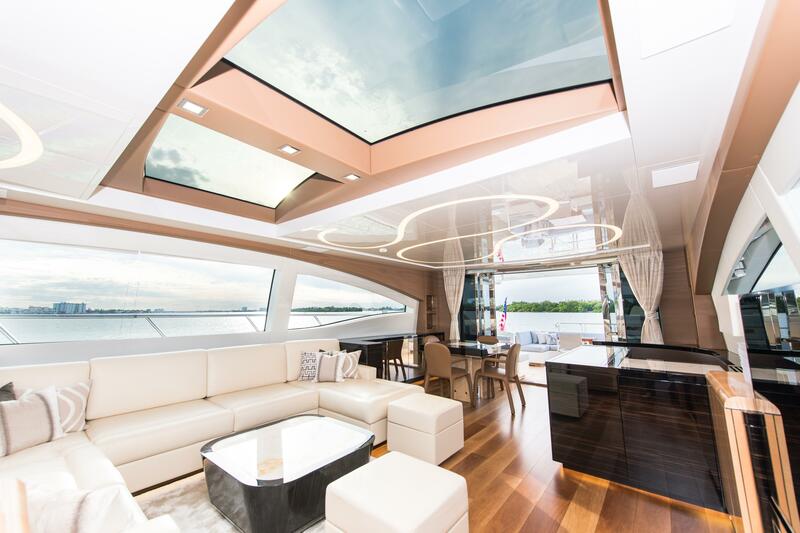 Her external lines are the distinctive racy, sporty MANGUSTA ones that have been defined by many as a timeless contemporary design. 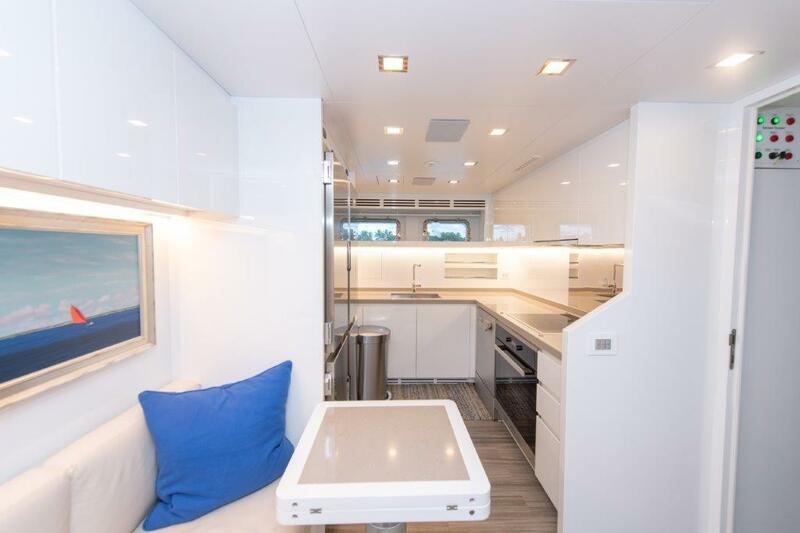 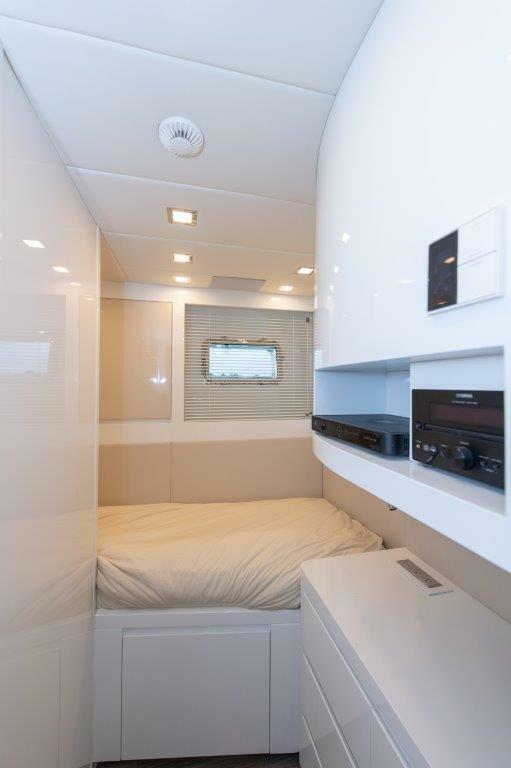 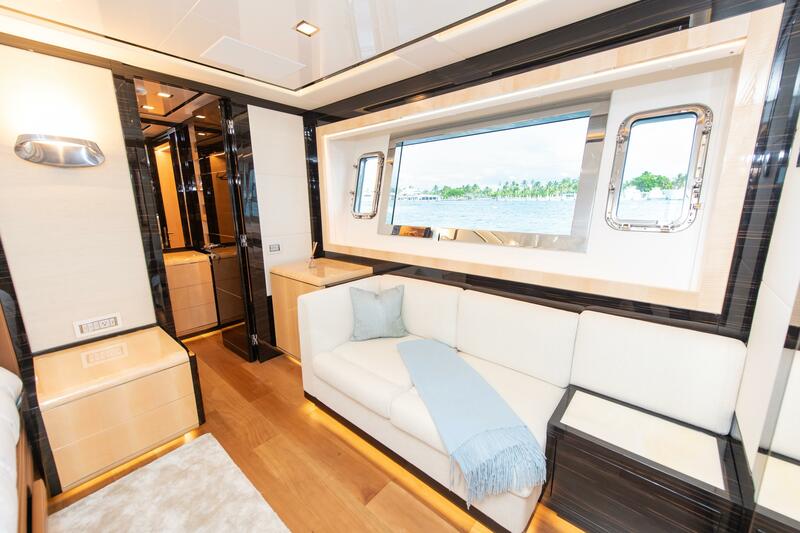 However, this 94’ MAXI OPEN has been enriched with new ideas which allow for greater usability of the external space, something usually found on larger models: even larger outdoor areas, a bow cockpit in addition to the sunbathing area and a livable sundeck. 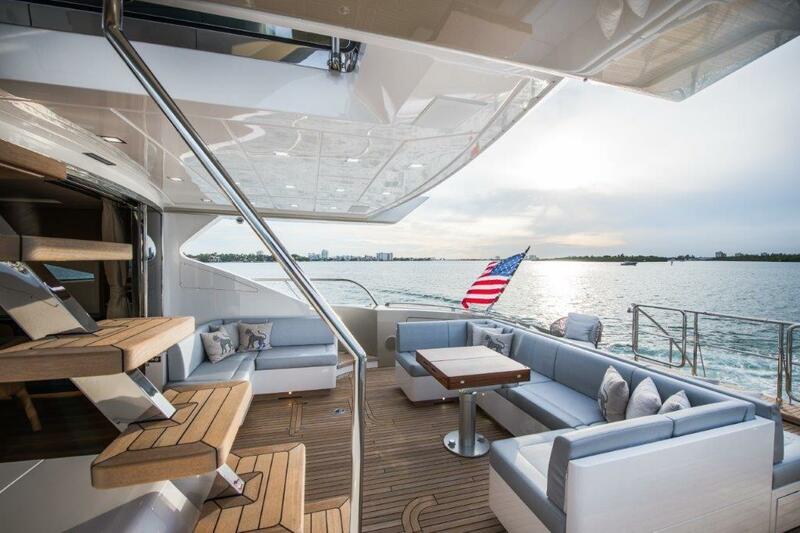 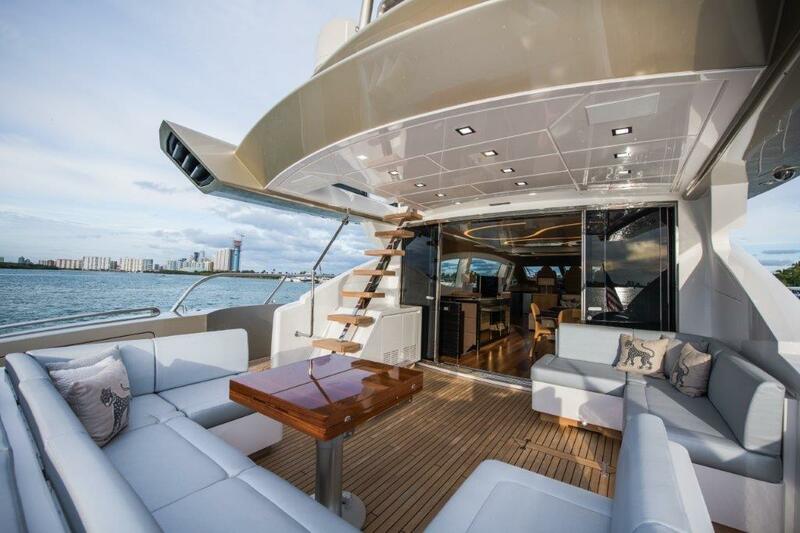 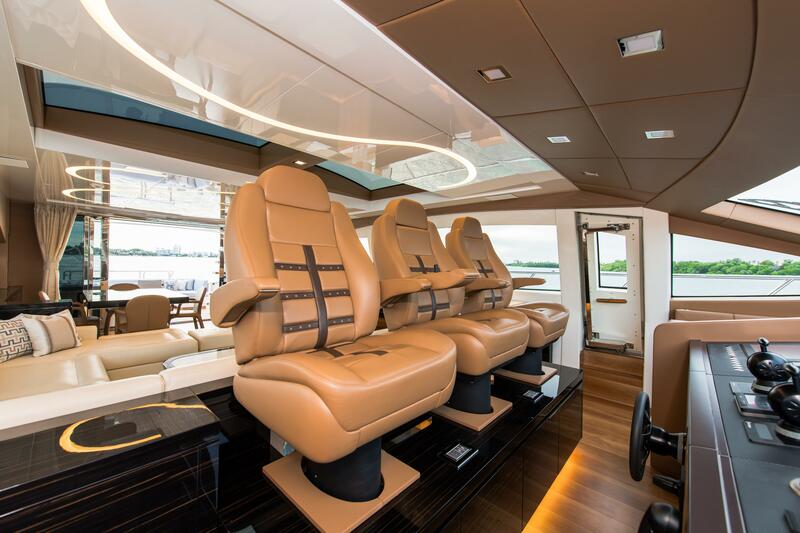 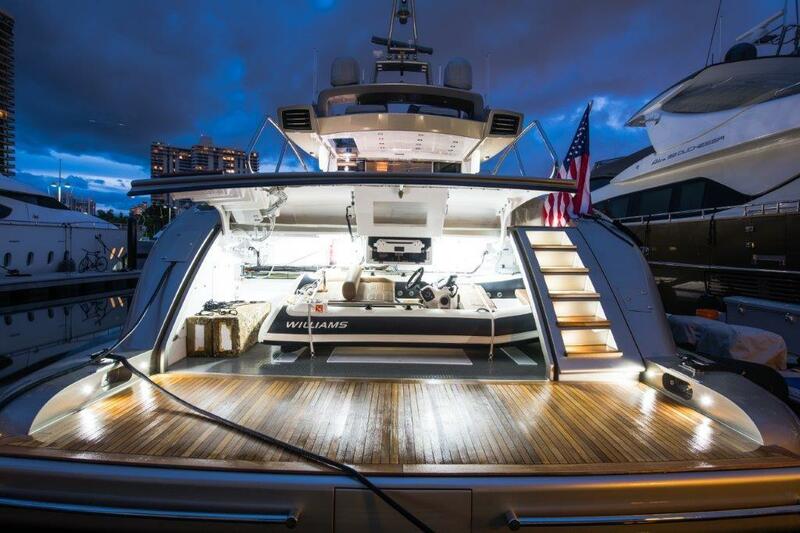 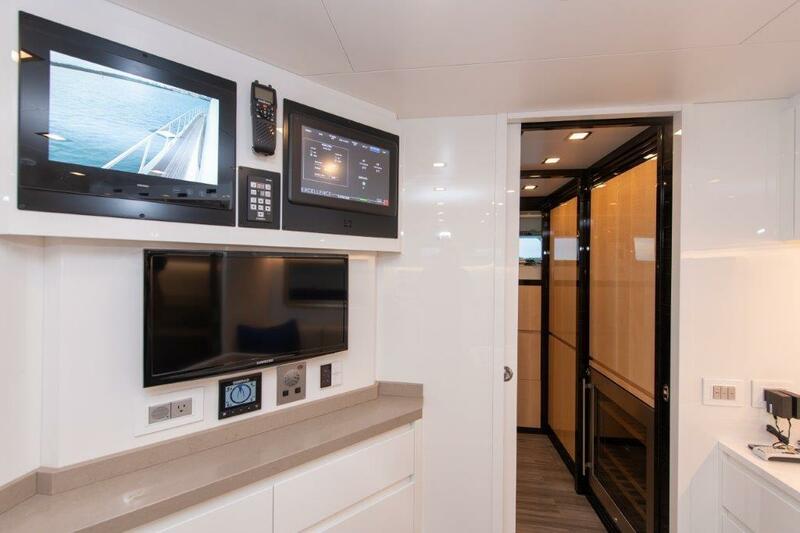 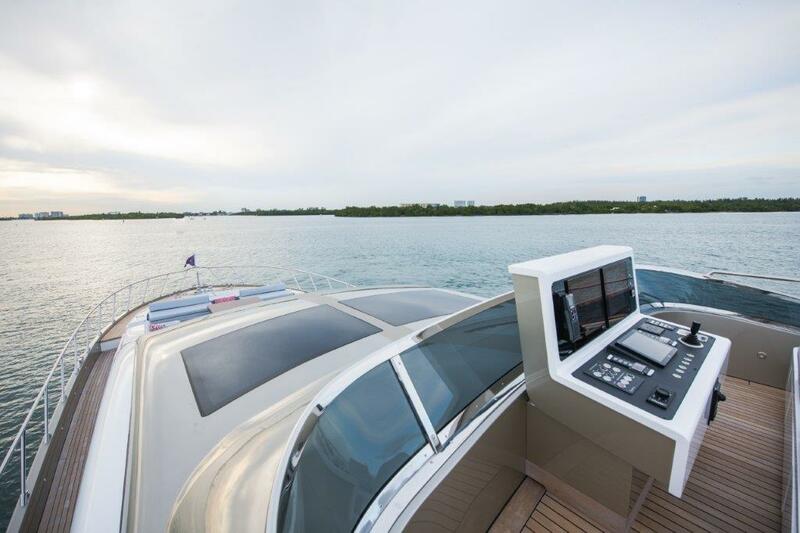 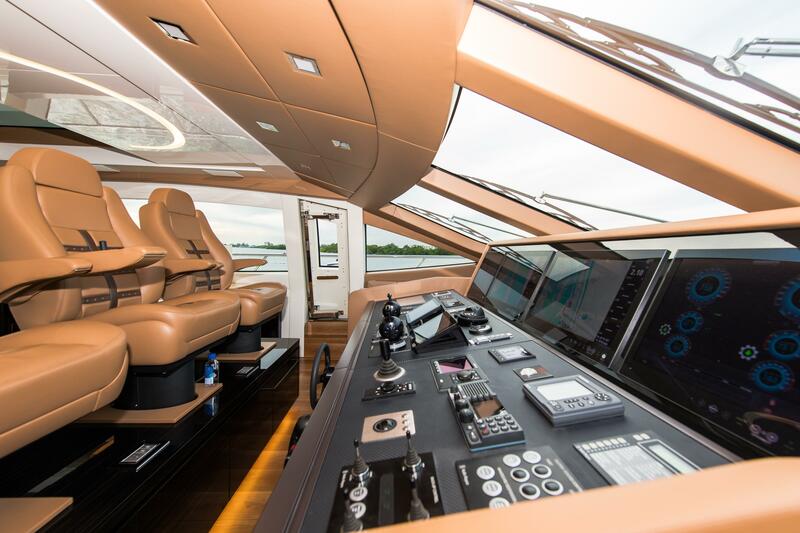 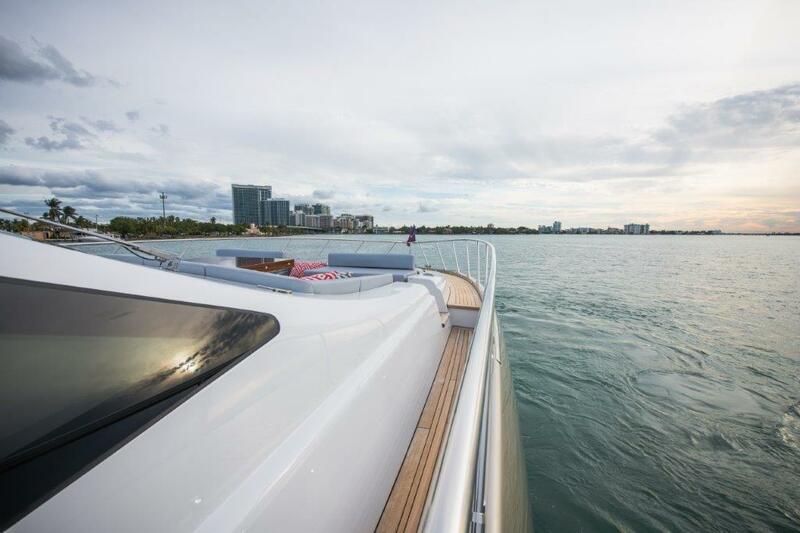 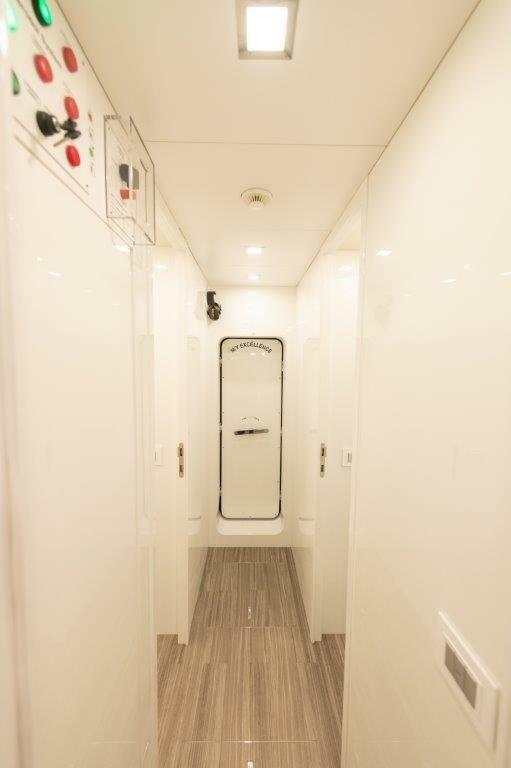 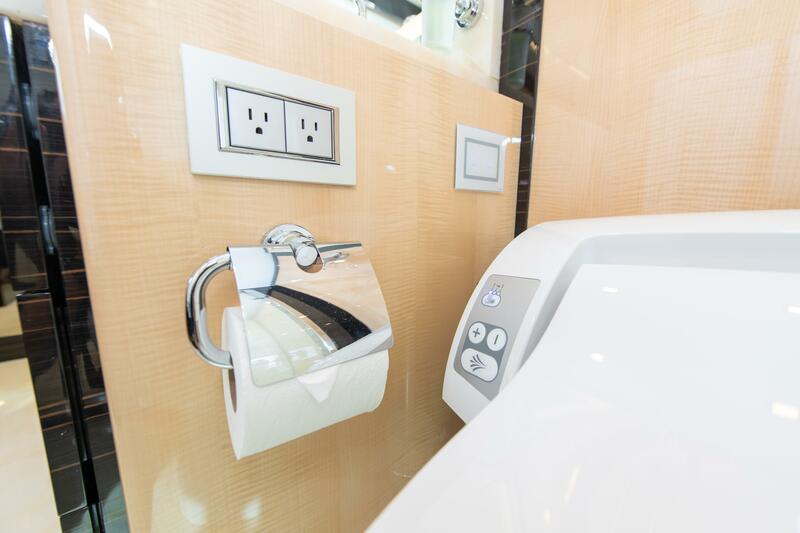 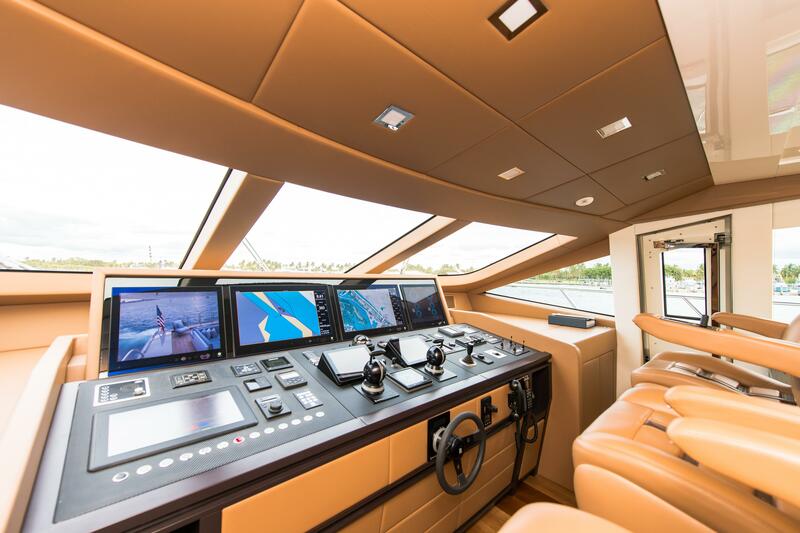 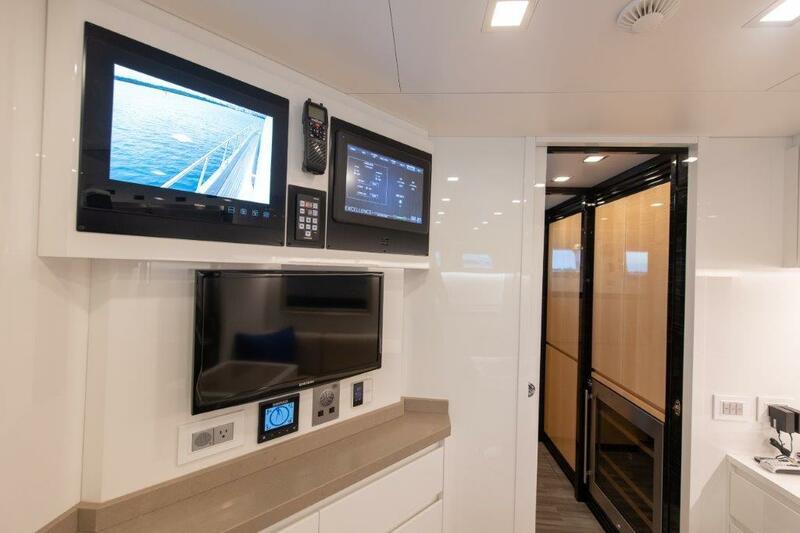 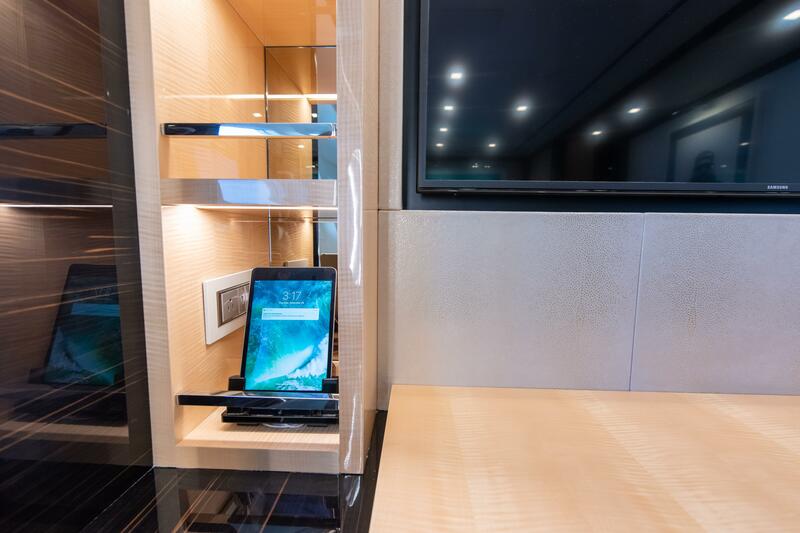 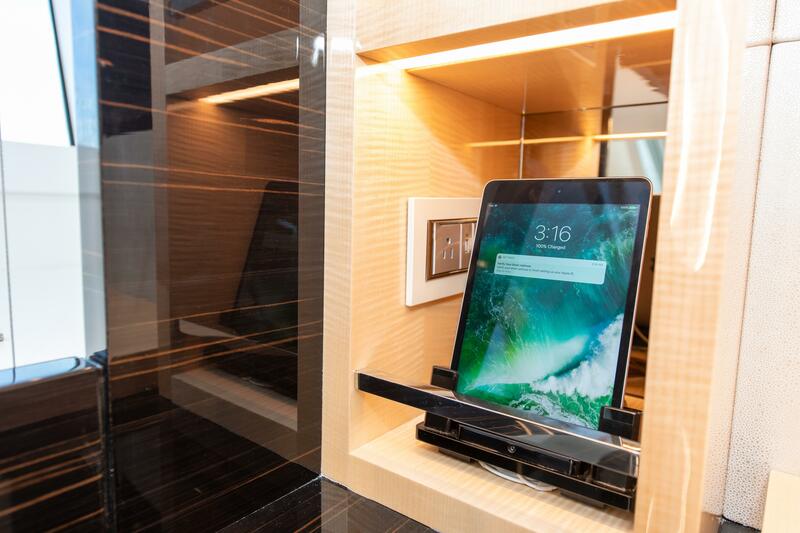 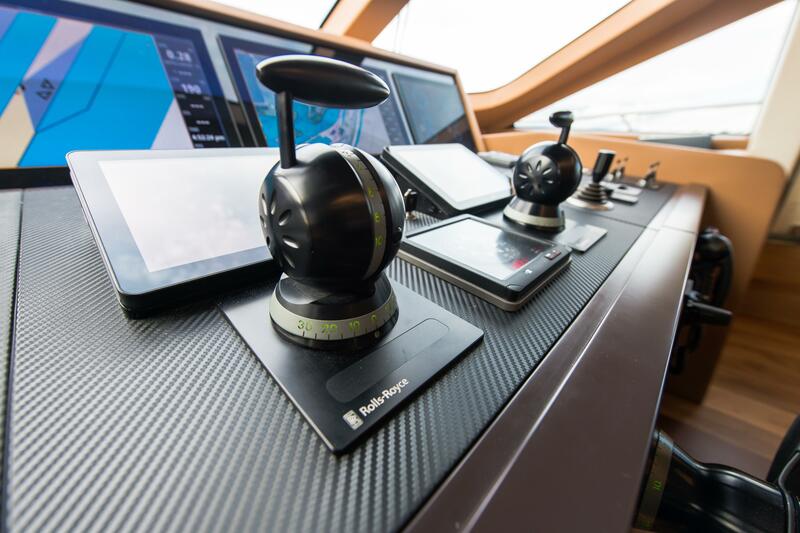 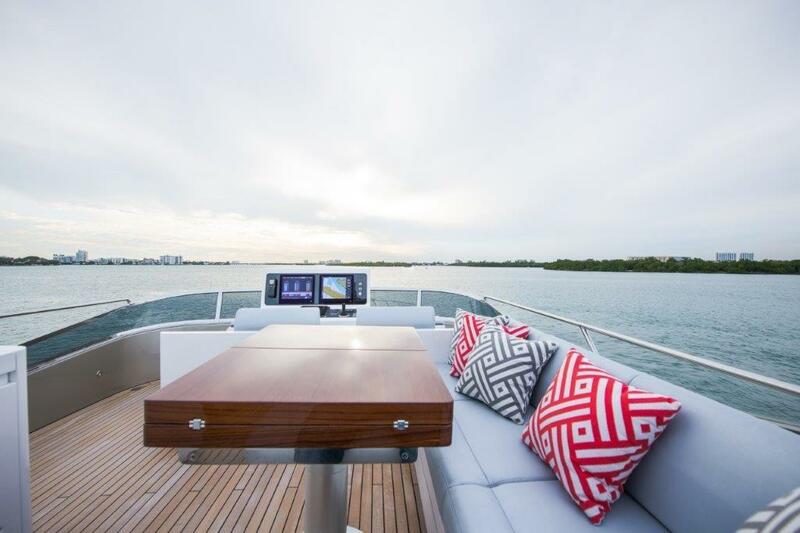 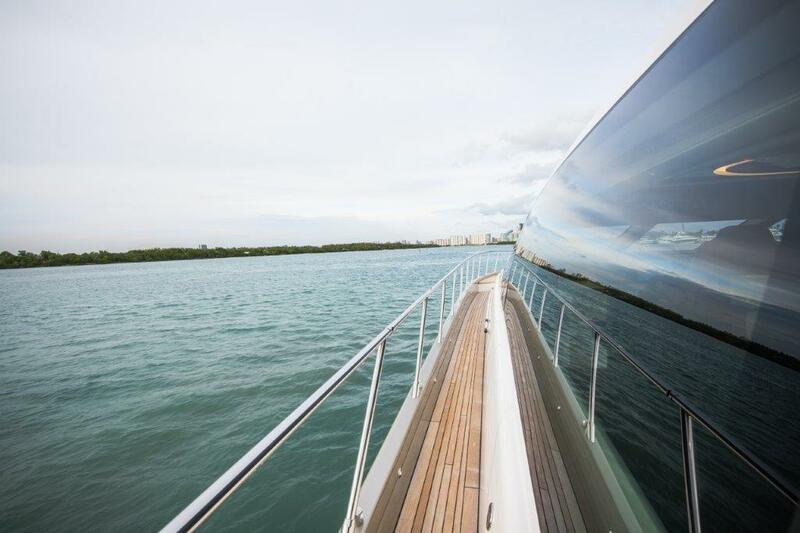 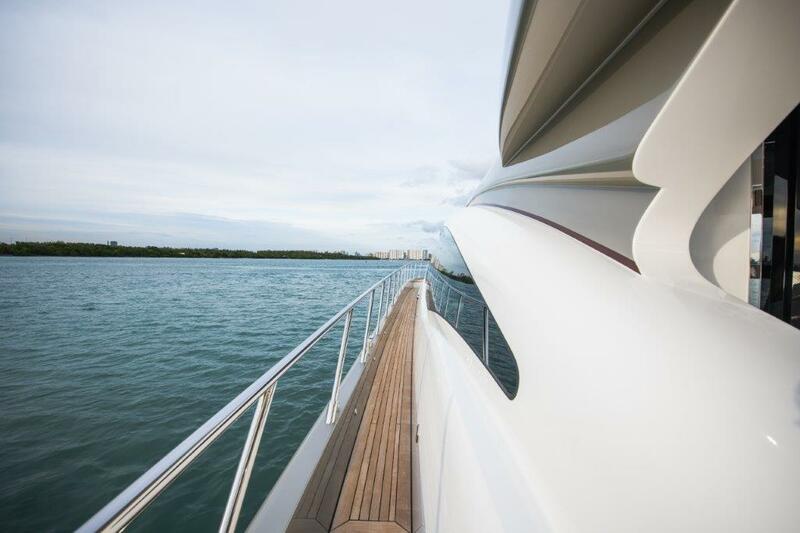 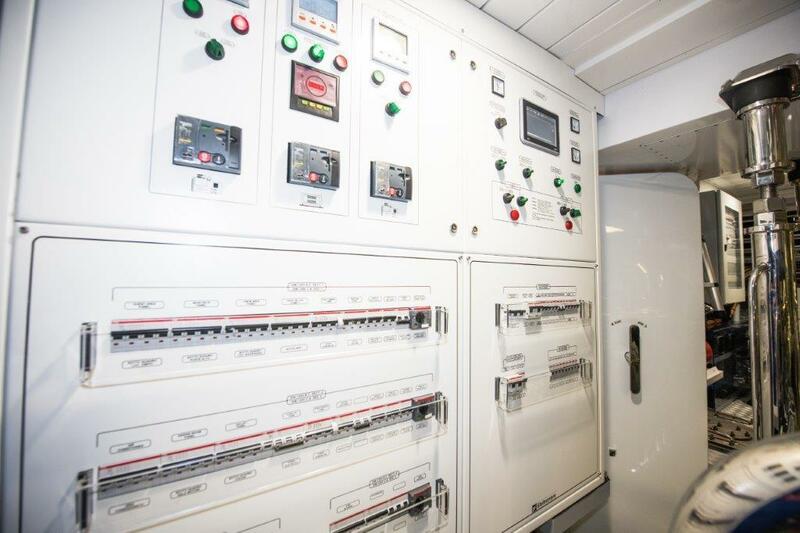 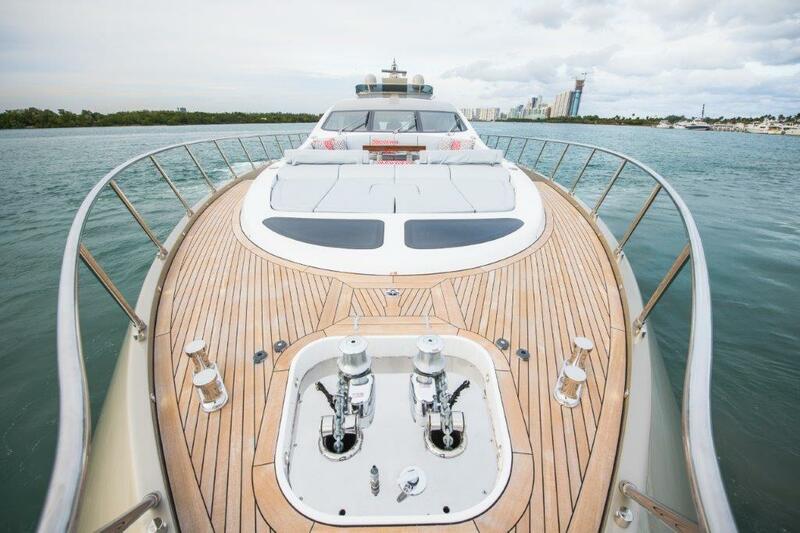 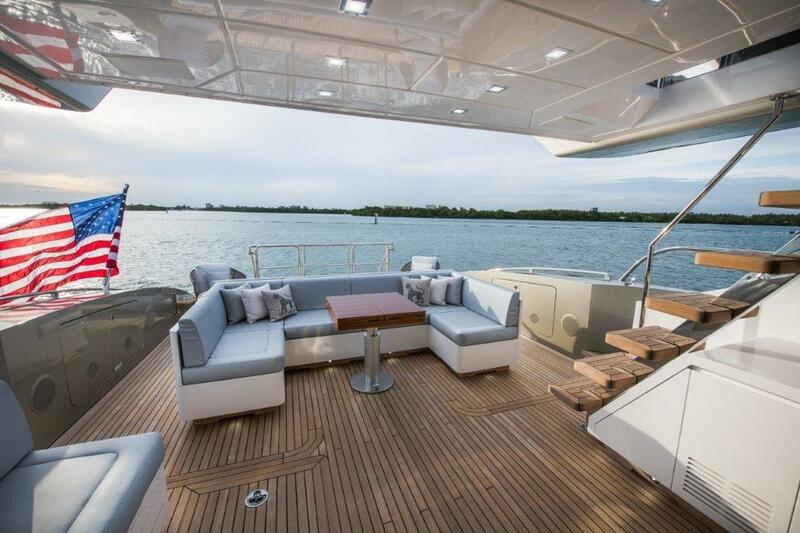 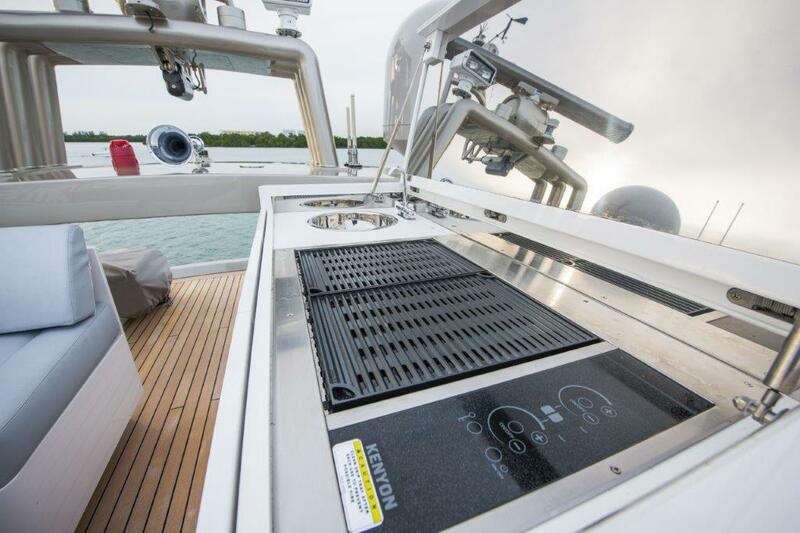 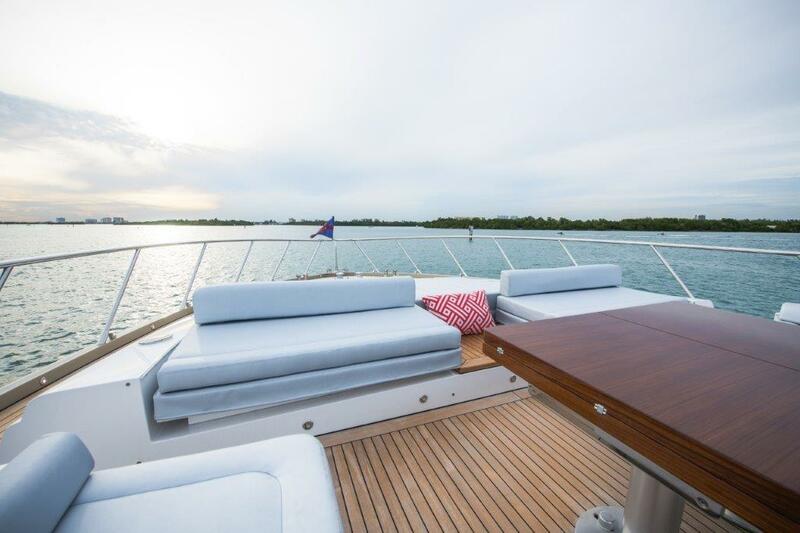 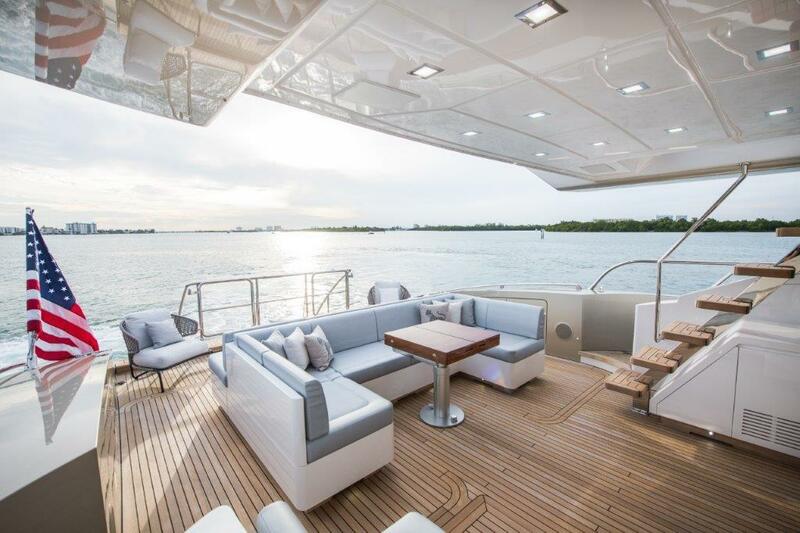 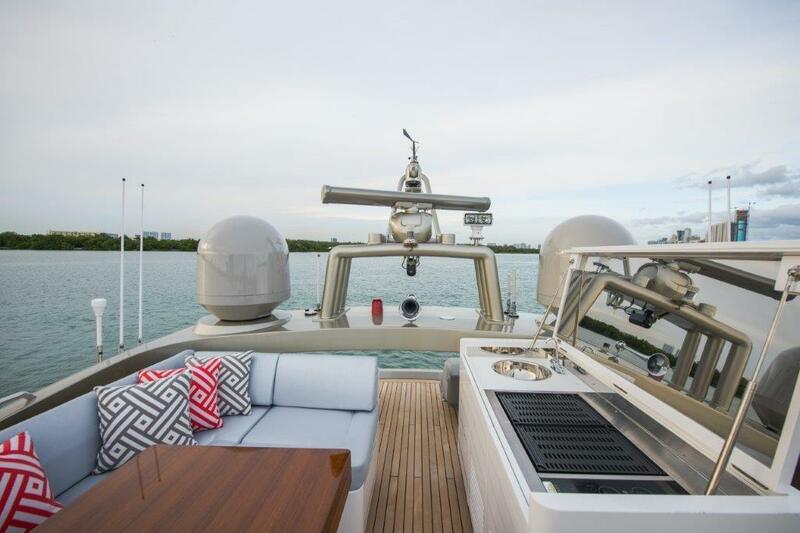 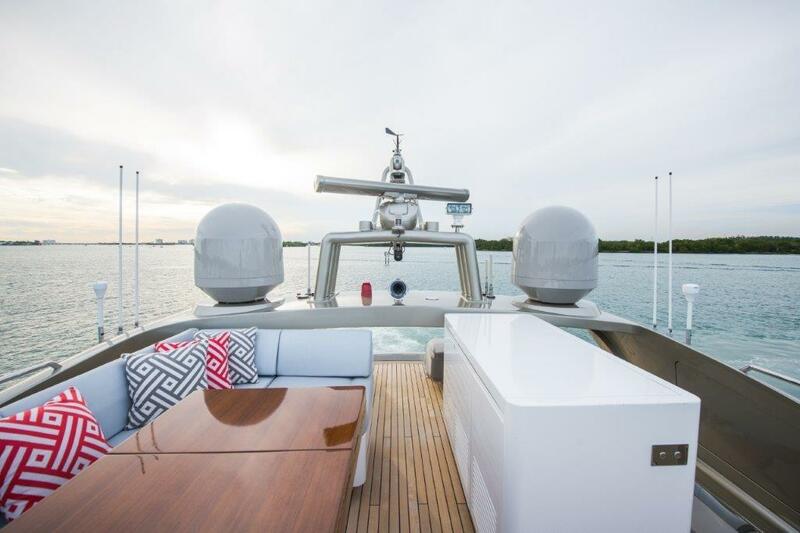 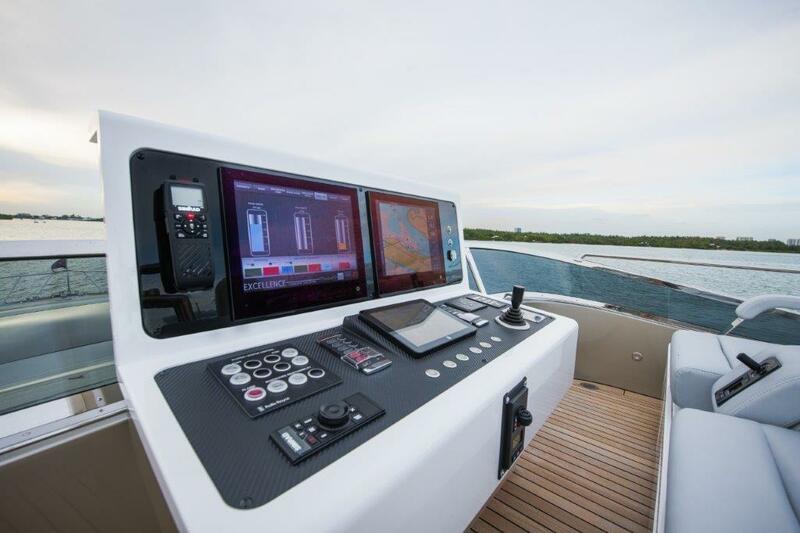 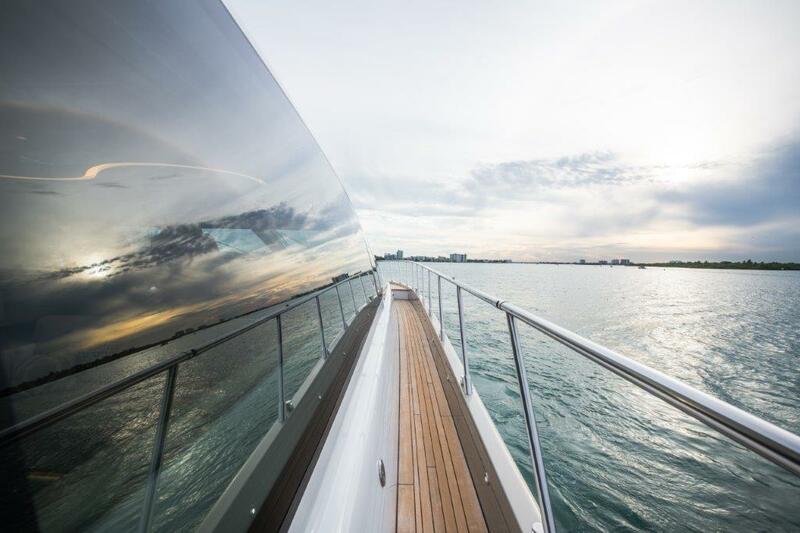 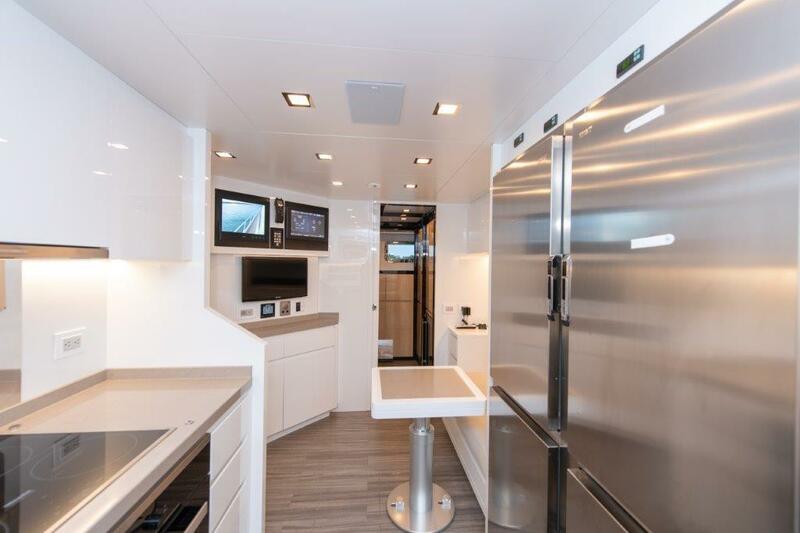 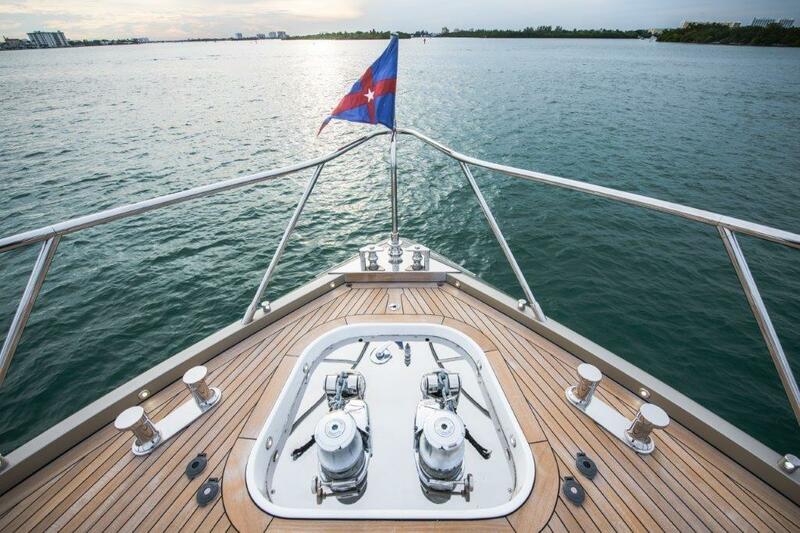 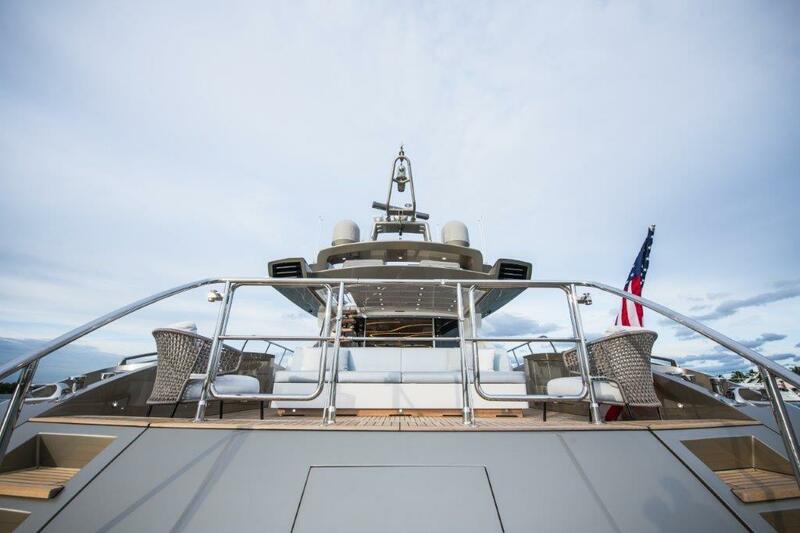 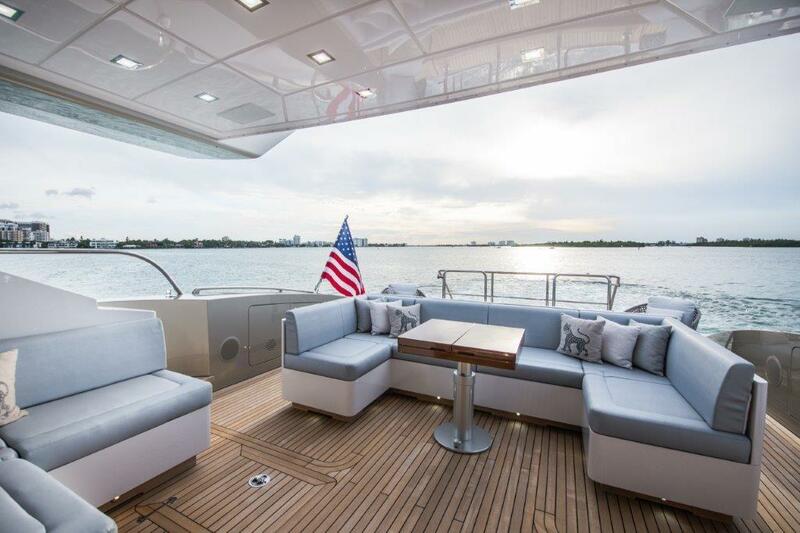 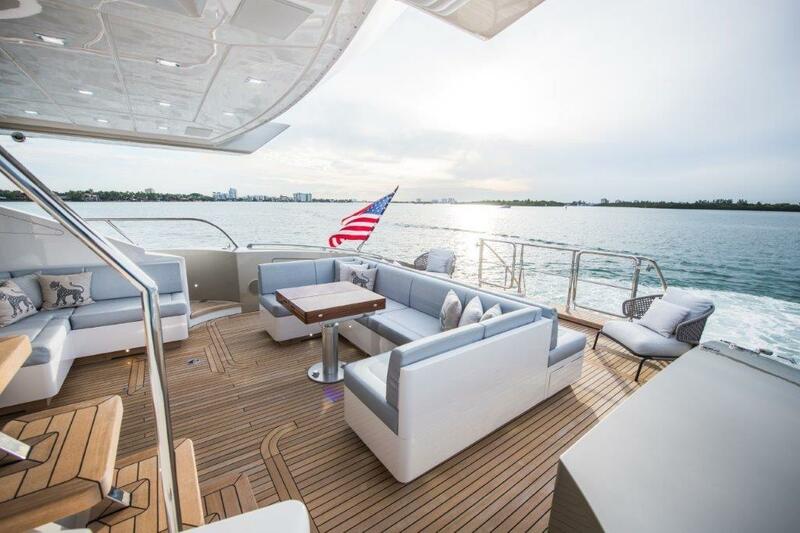 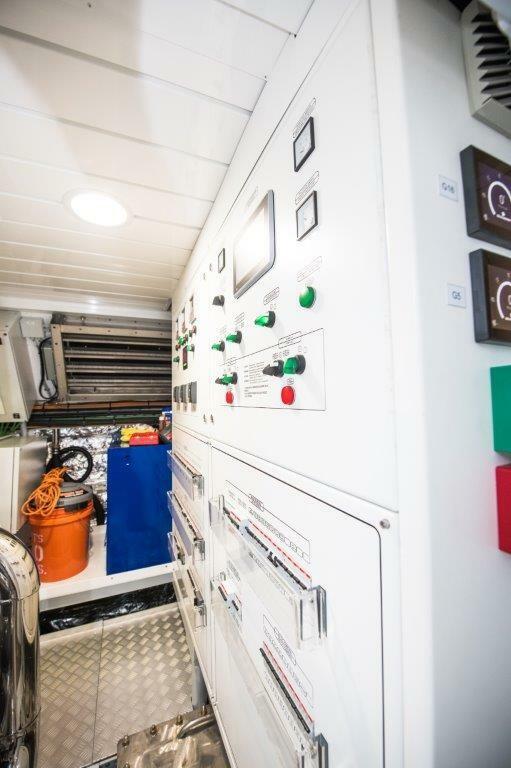 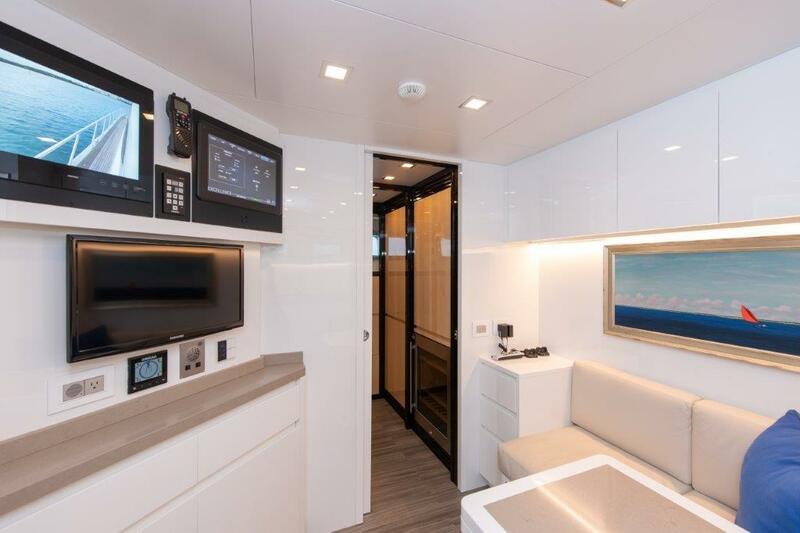 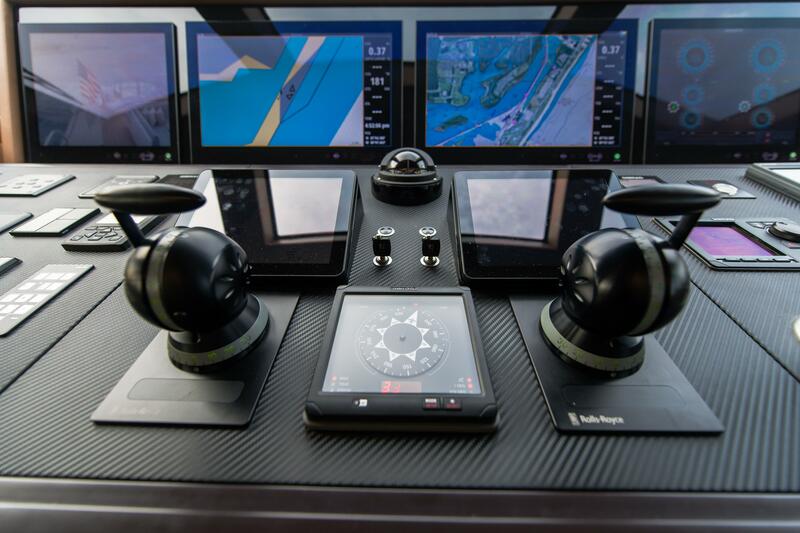 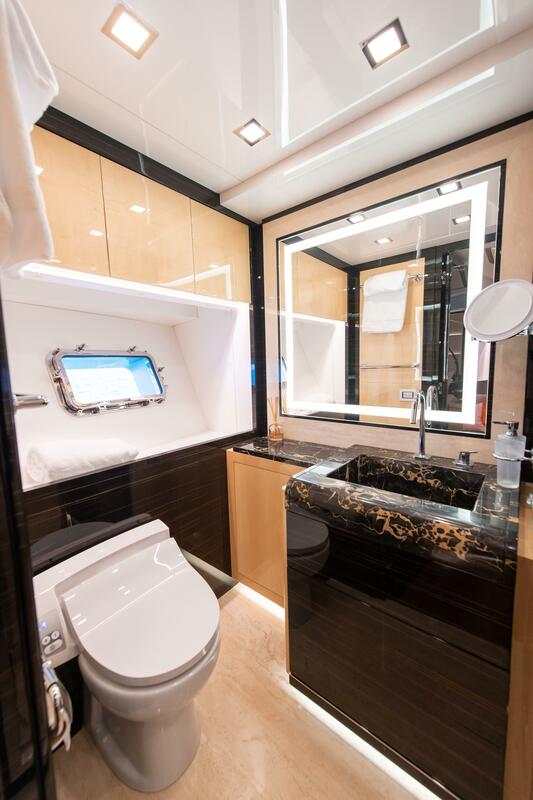 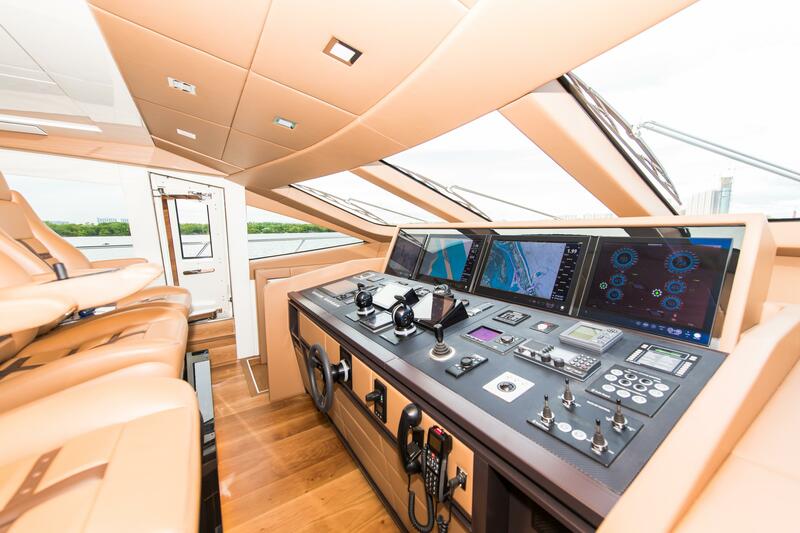 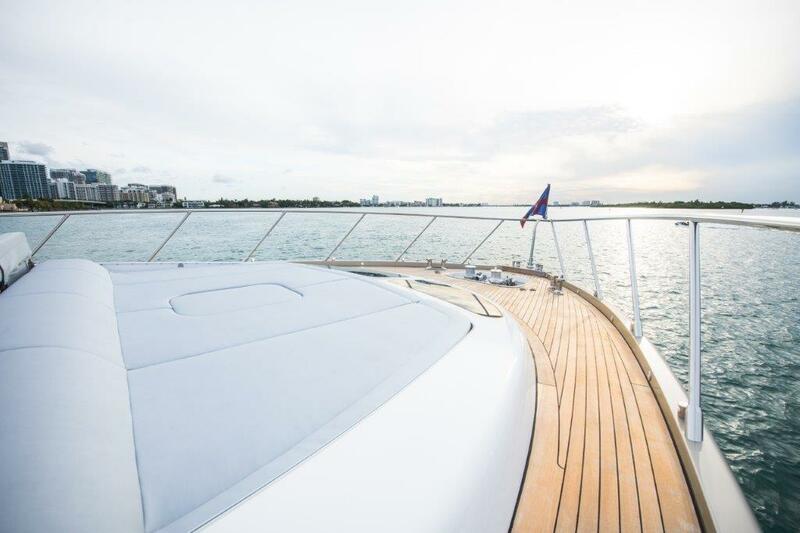 Equipped with a custom and additional control station on the fly bridge, you will not have to sacrifice missing out on amazing moments with your guests during navigation. 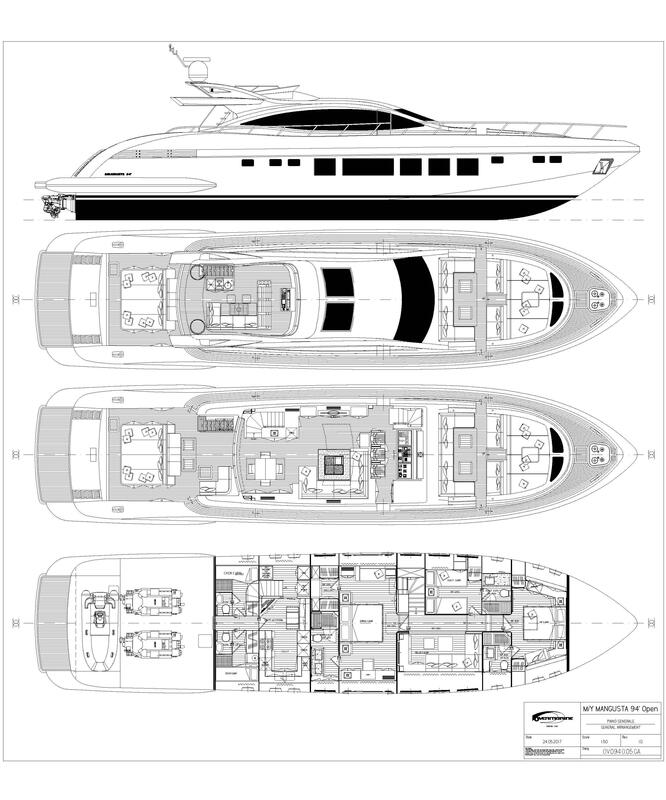 Measuring 94 feet in length, the size of this MANGUSTA YACHT is real, something which is clear in the spacious onboard volumes. 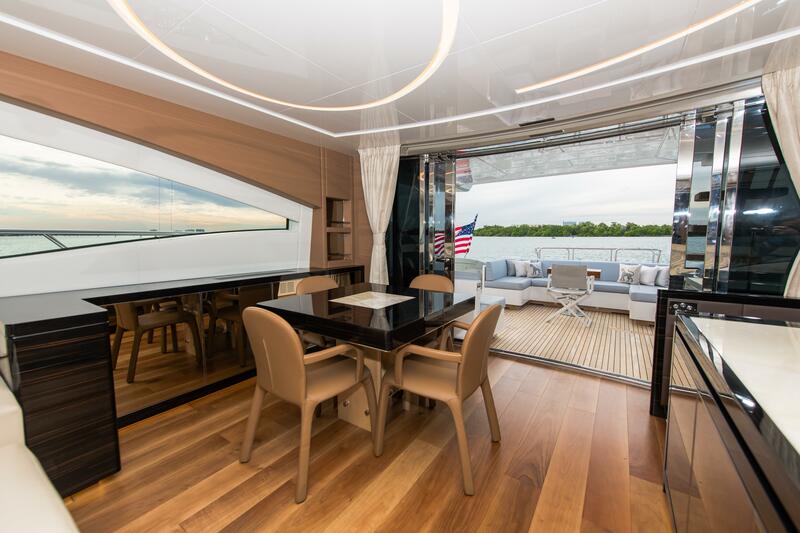 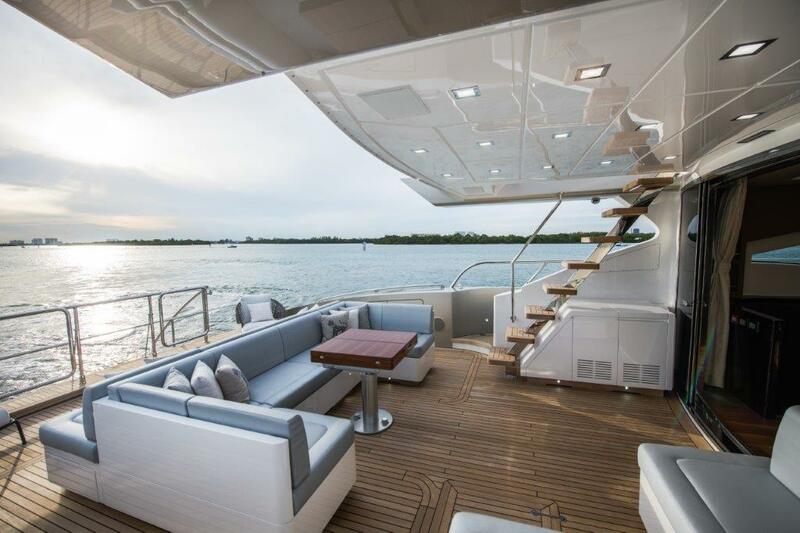 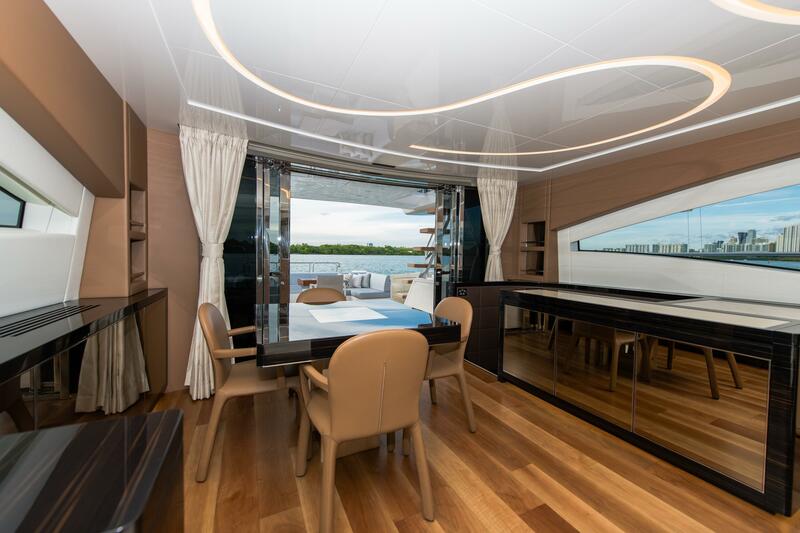 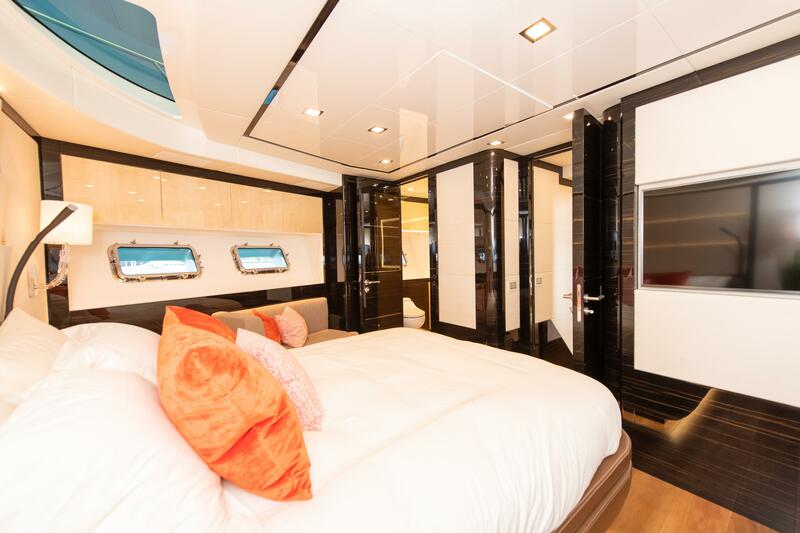 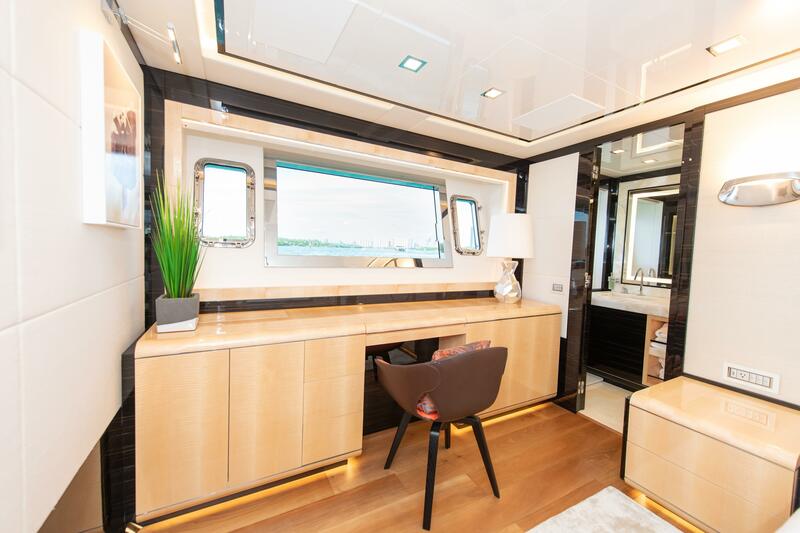 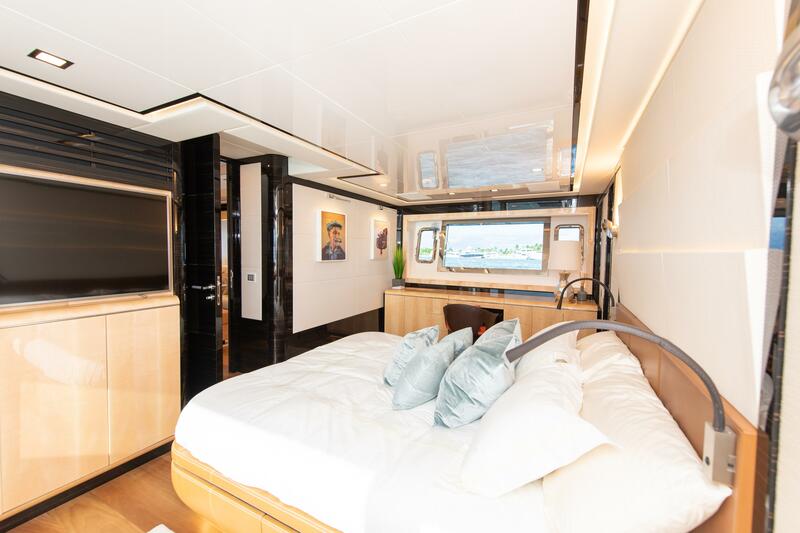 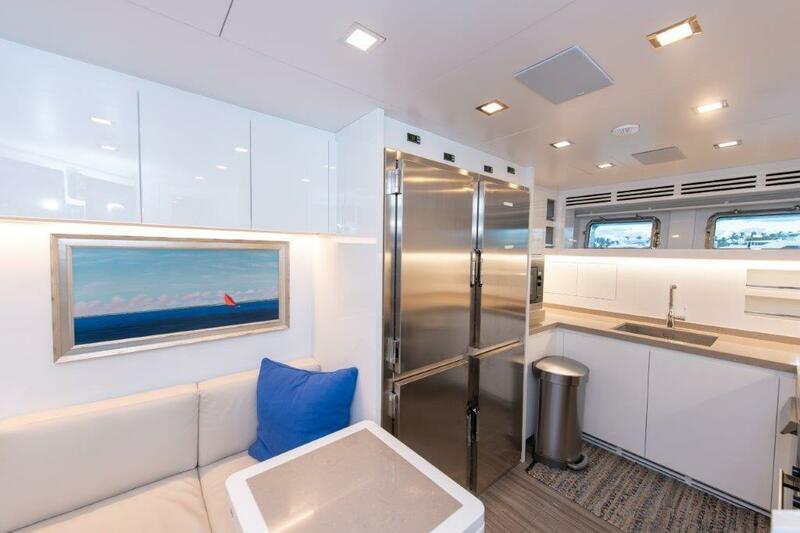 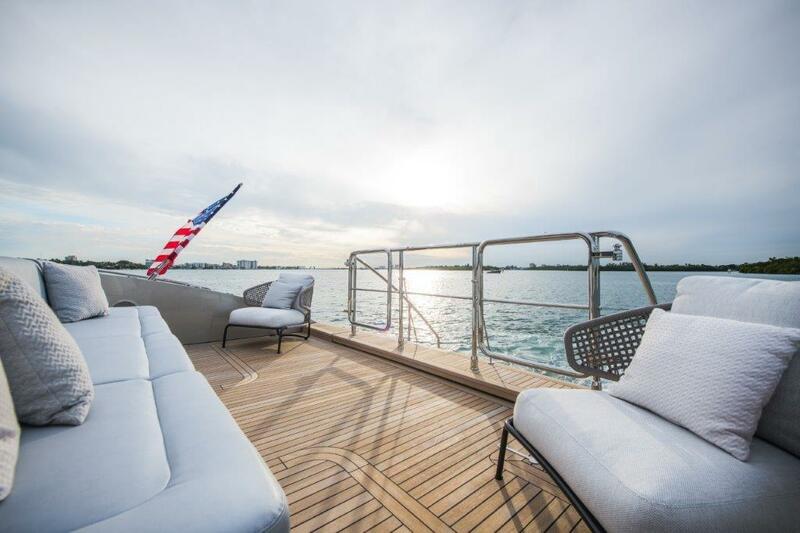 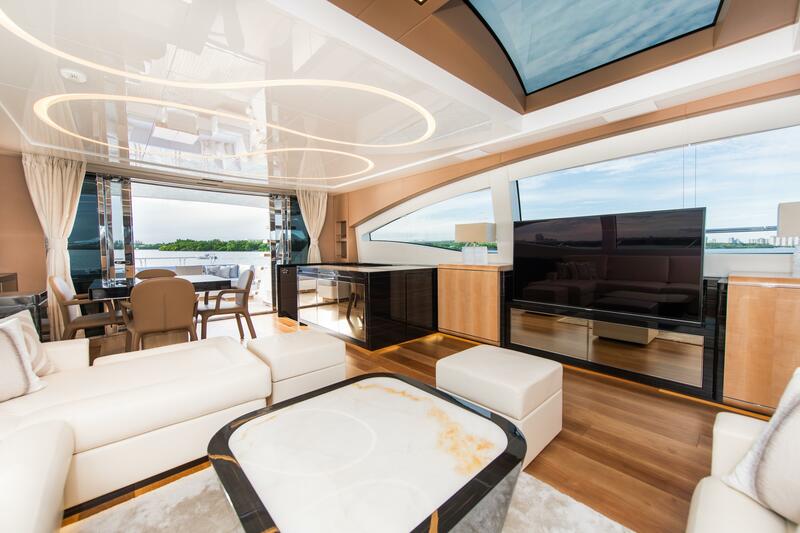 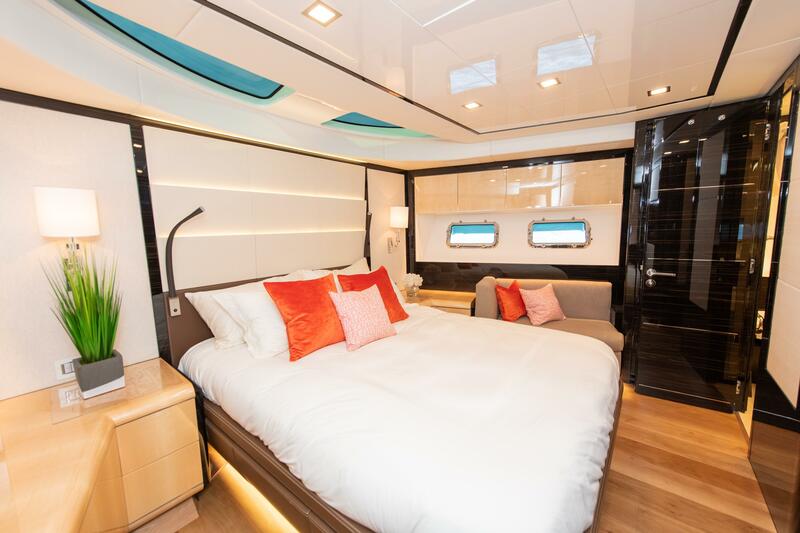 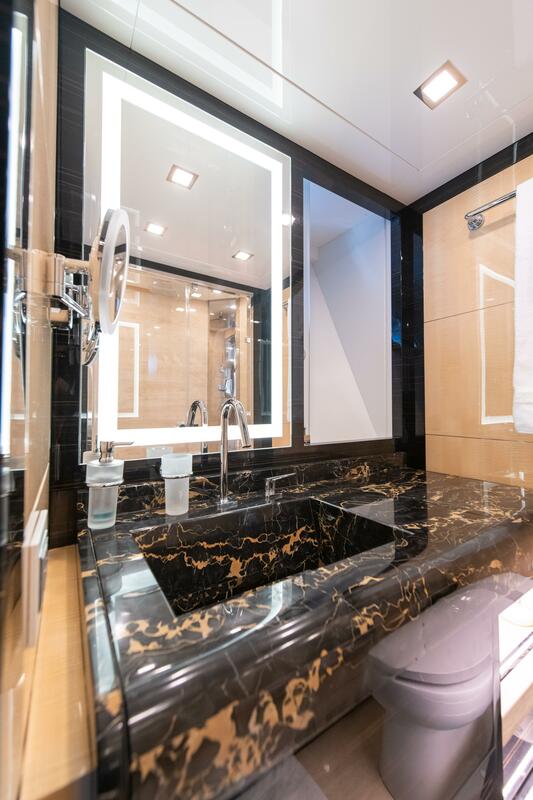 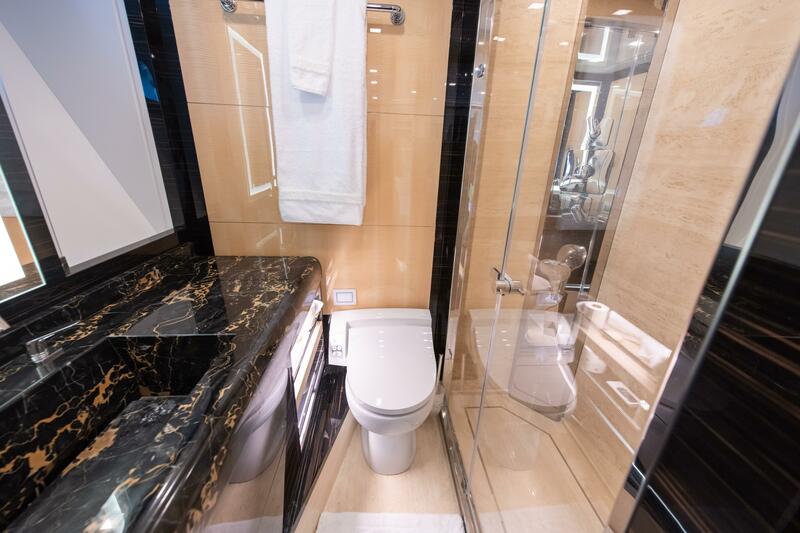 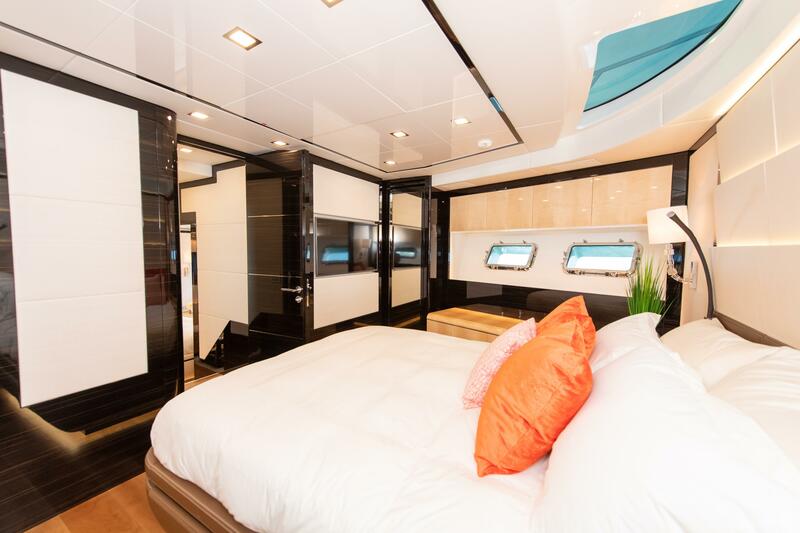 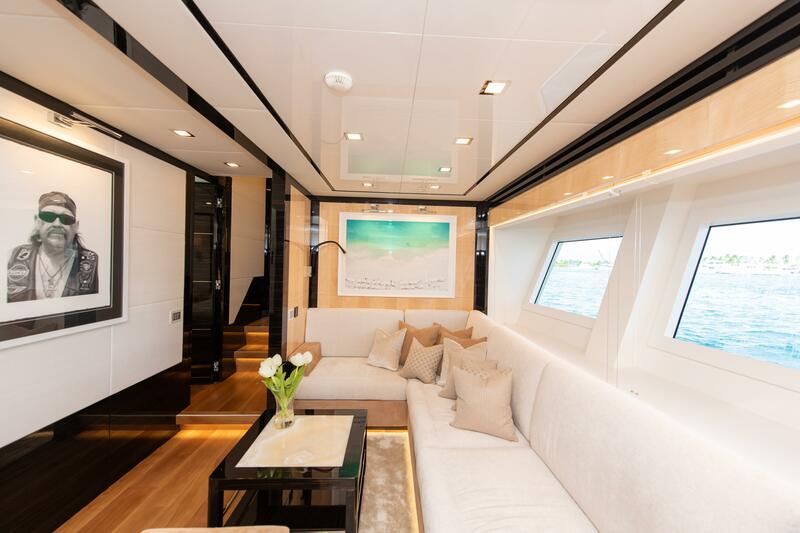 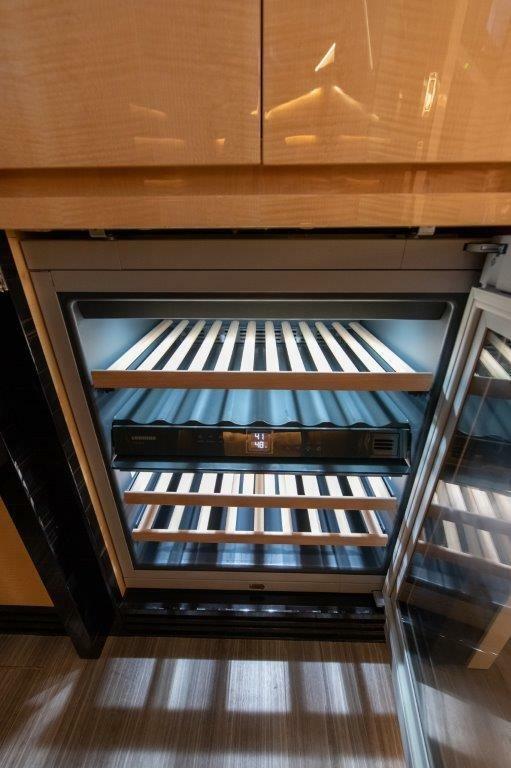 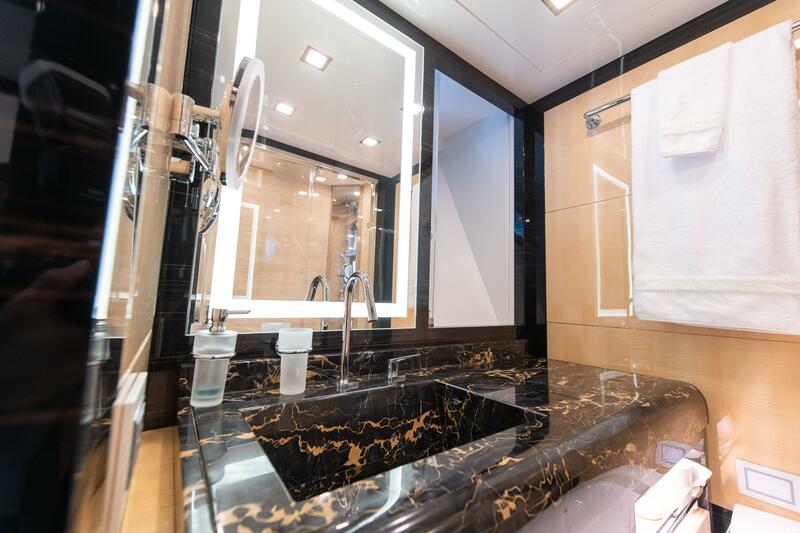 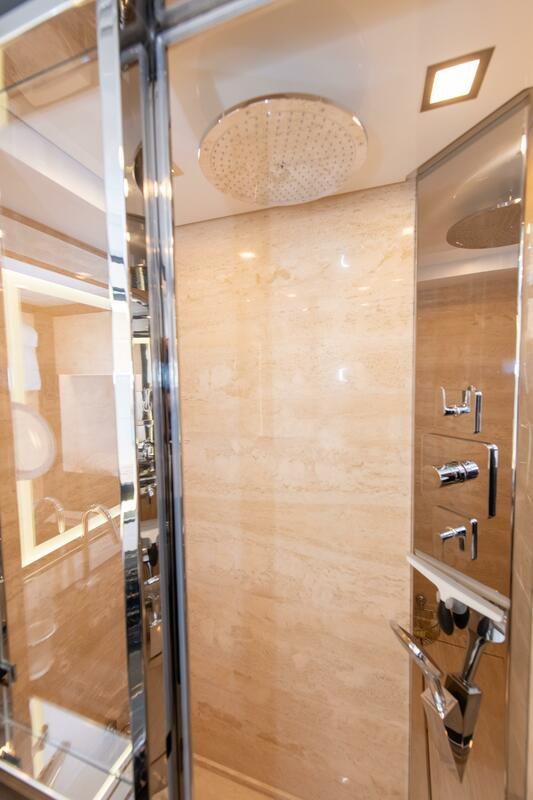 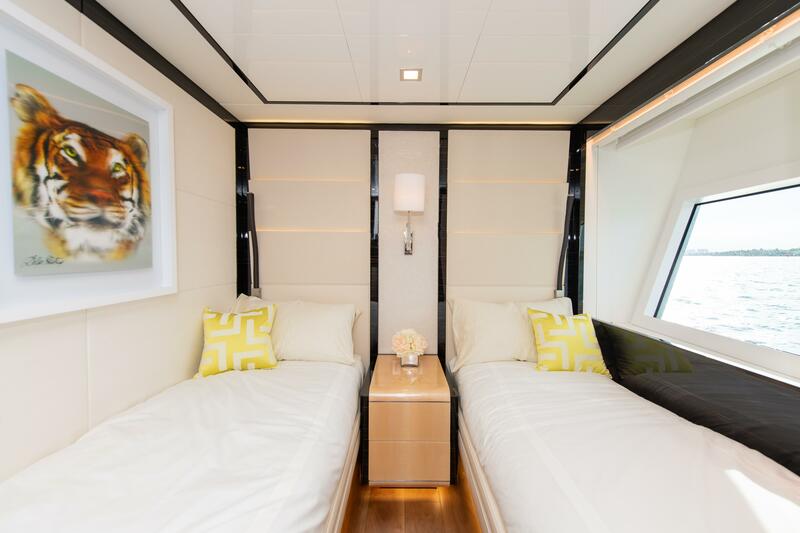 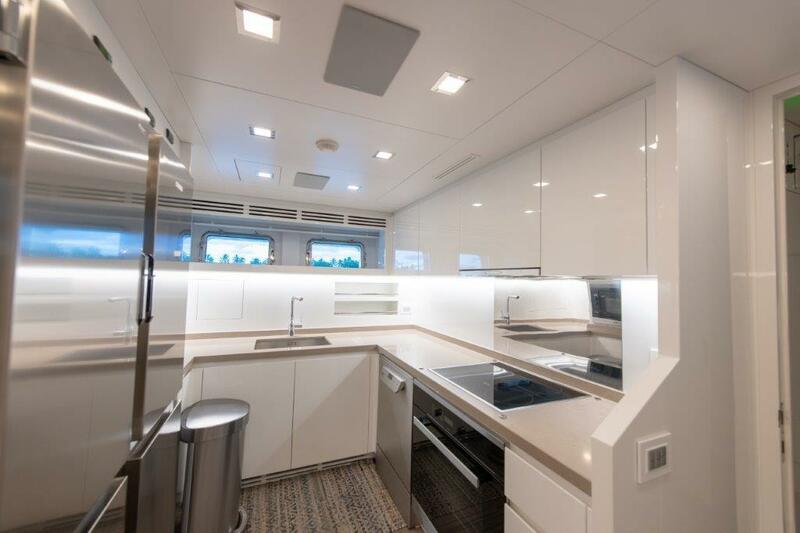 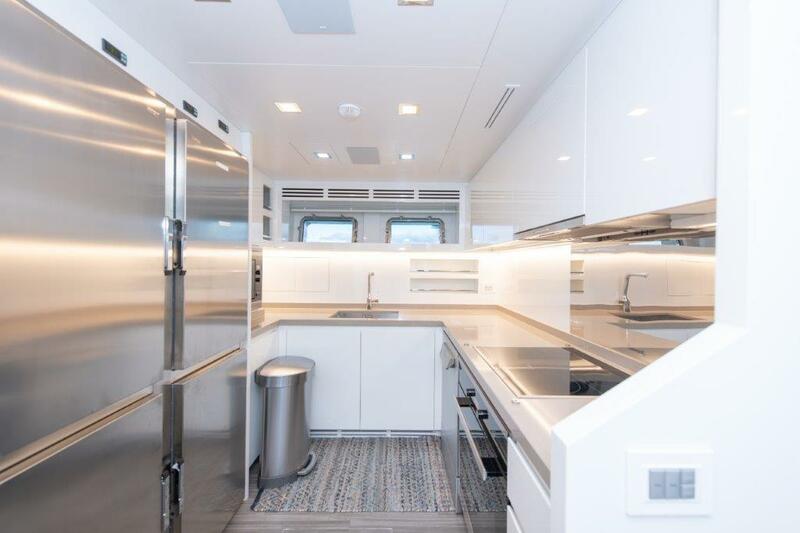 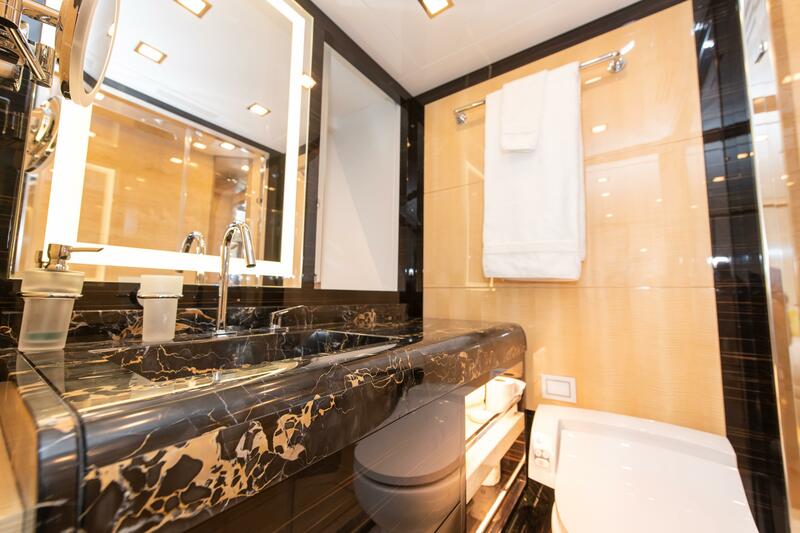 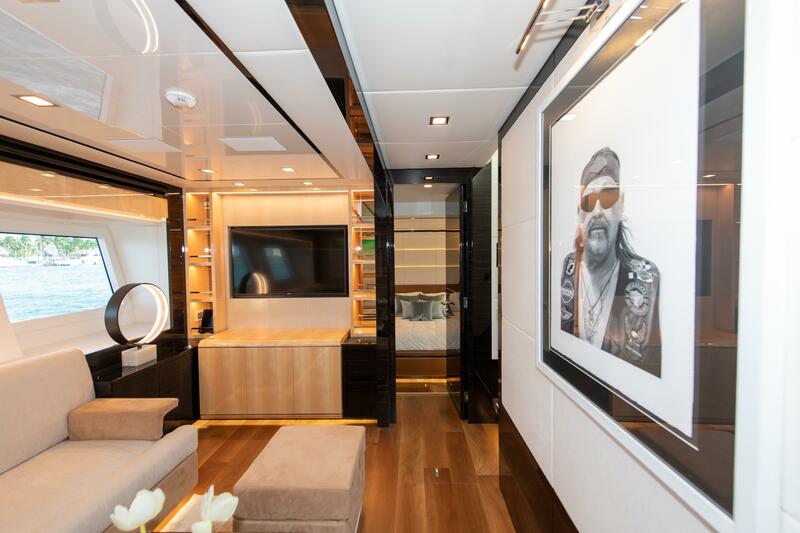 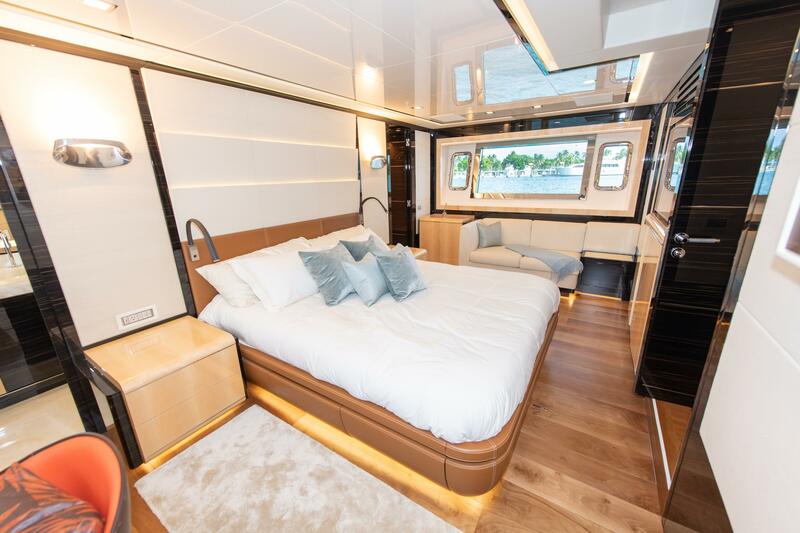 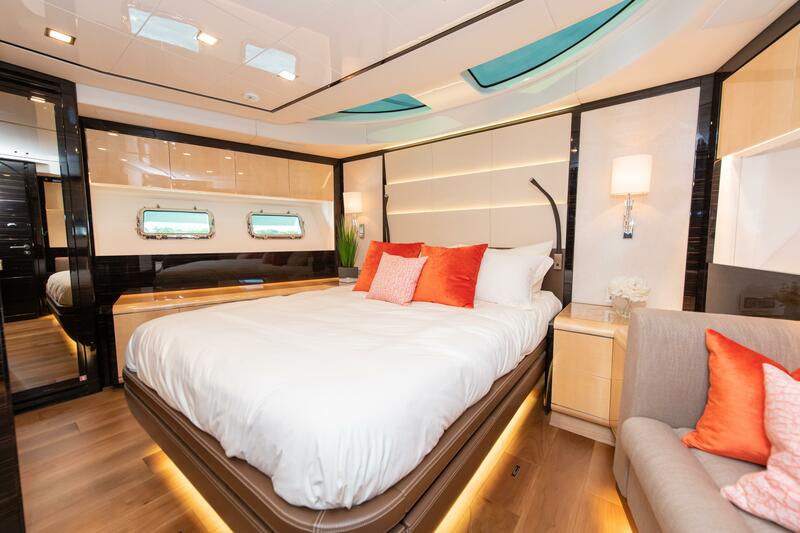 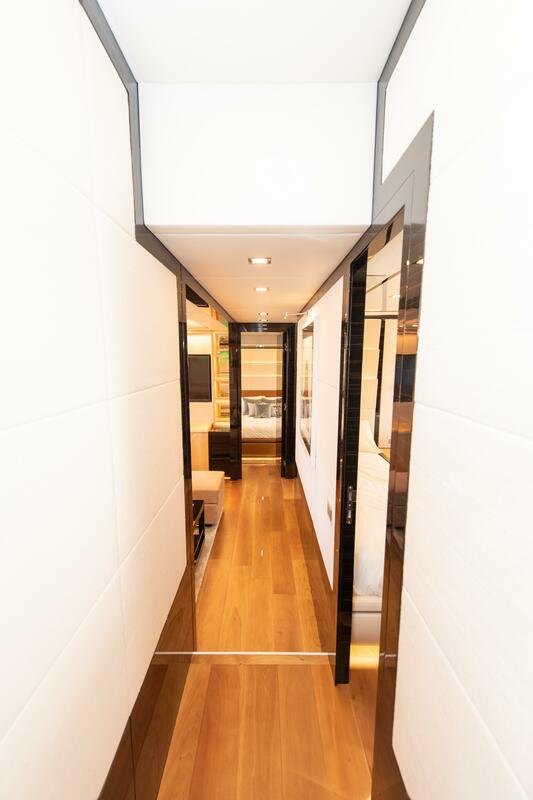 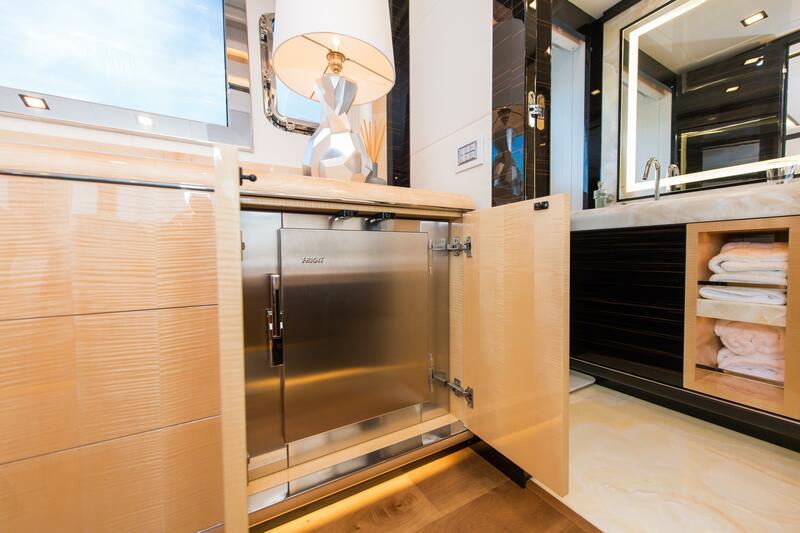 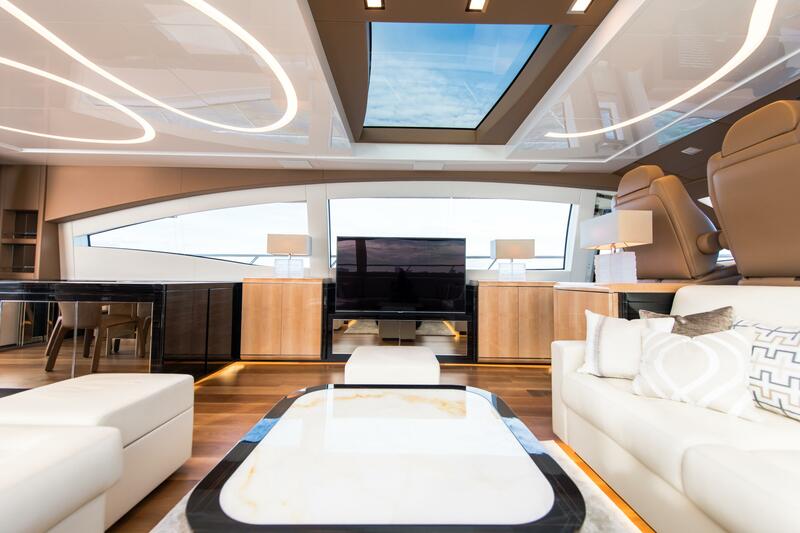 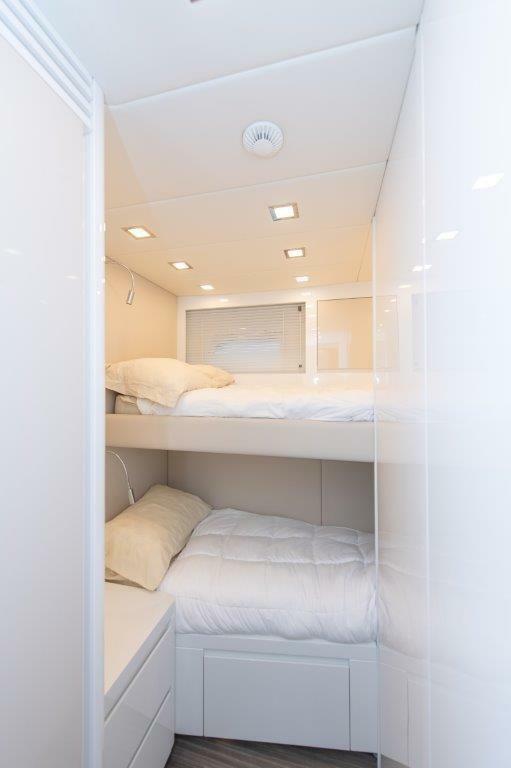 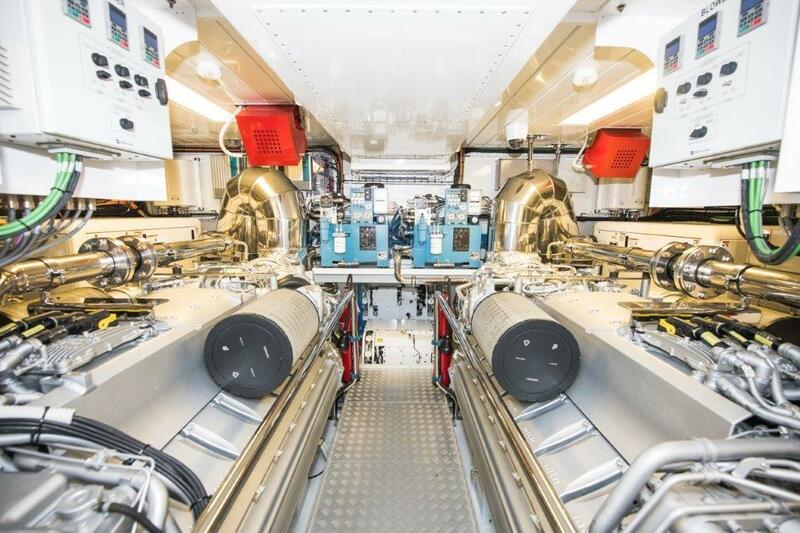 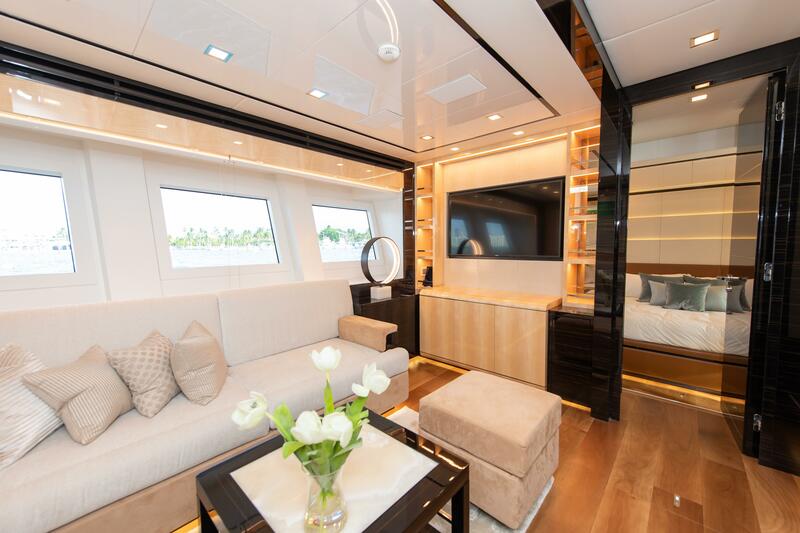 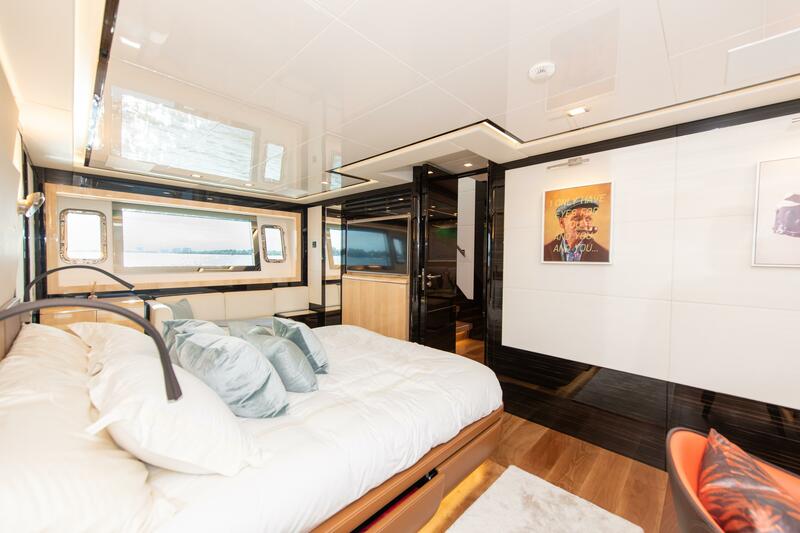 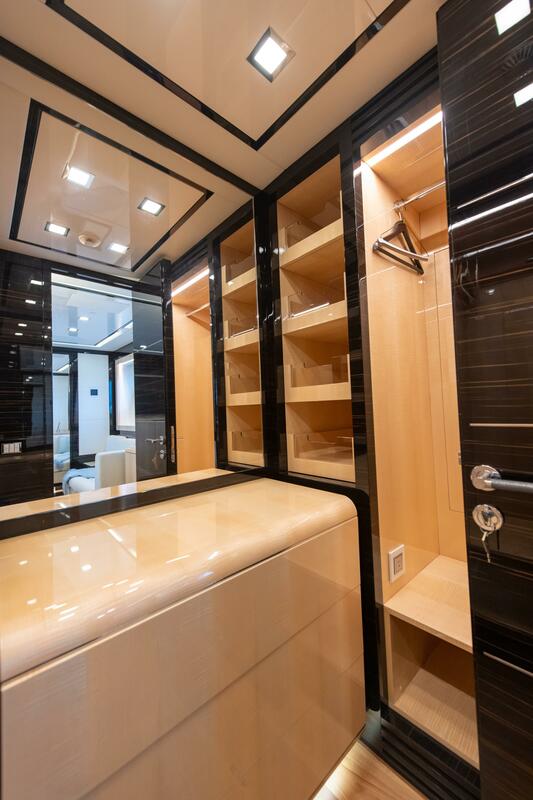 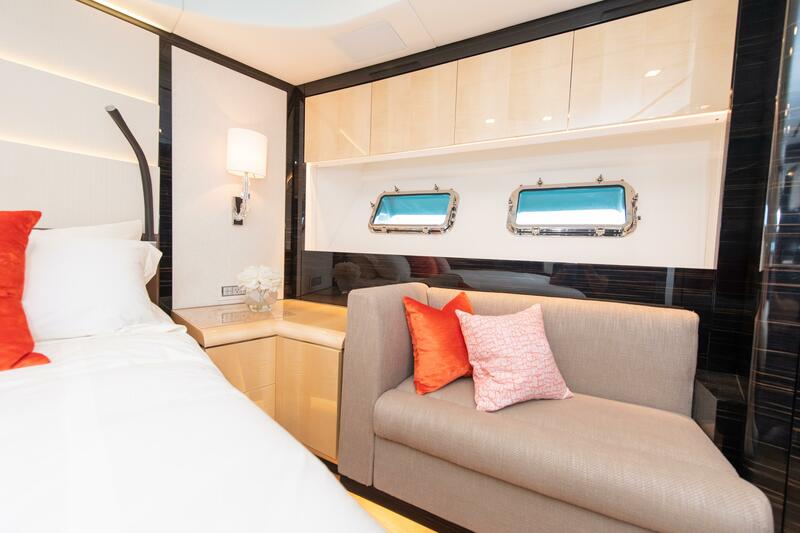 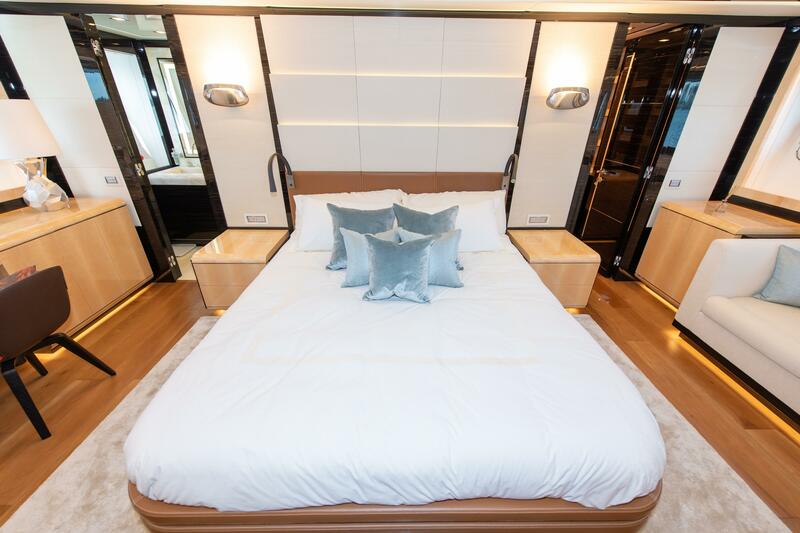 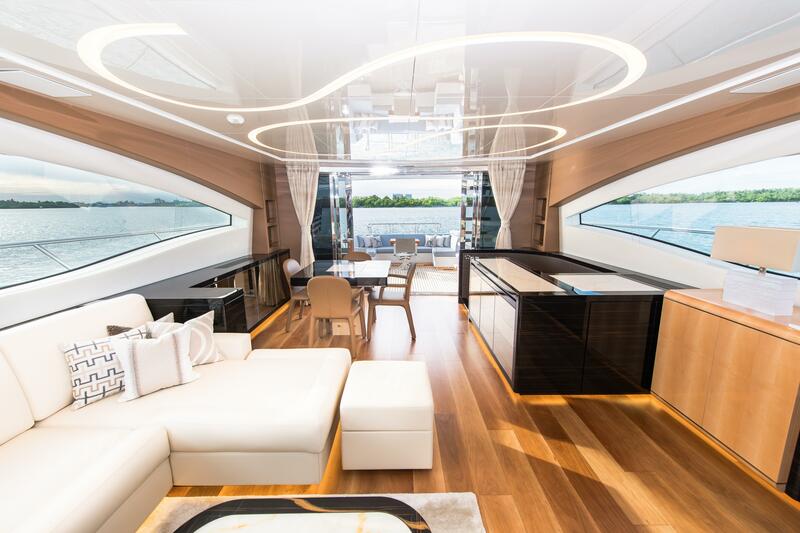 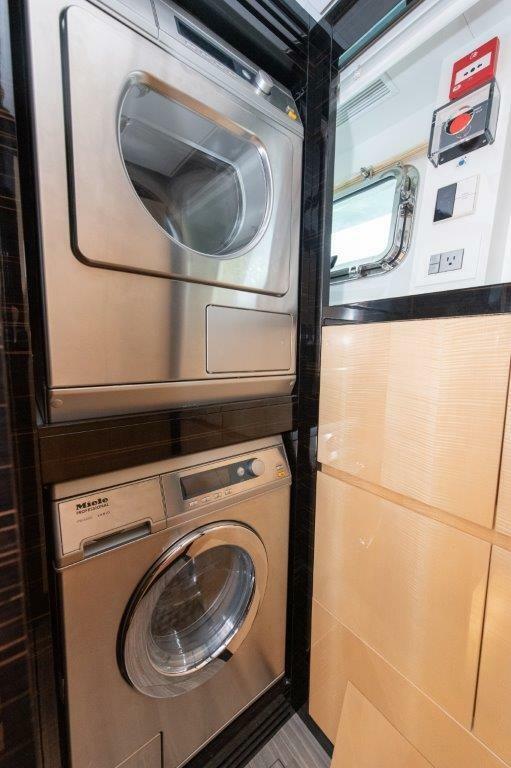 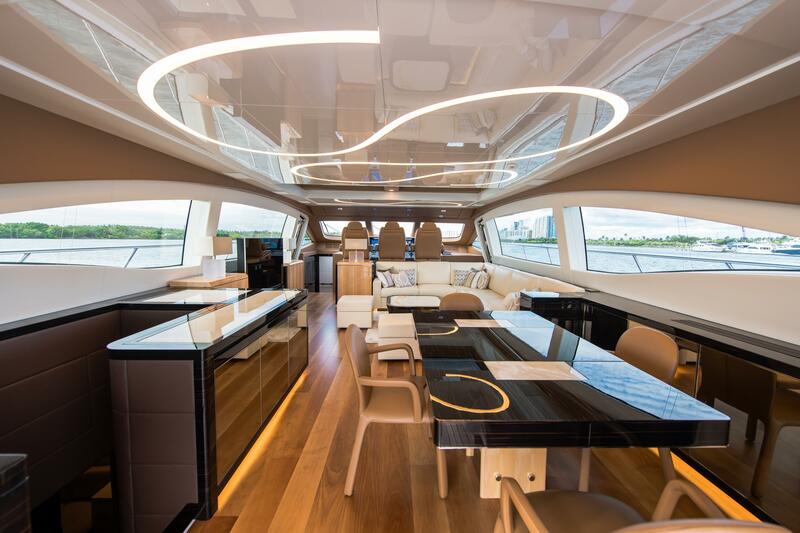 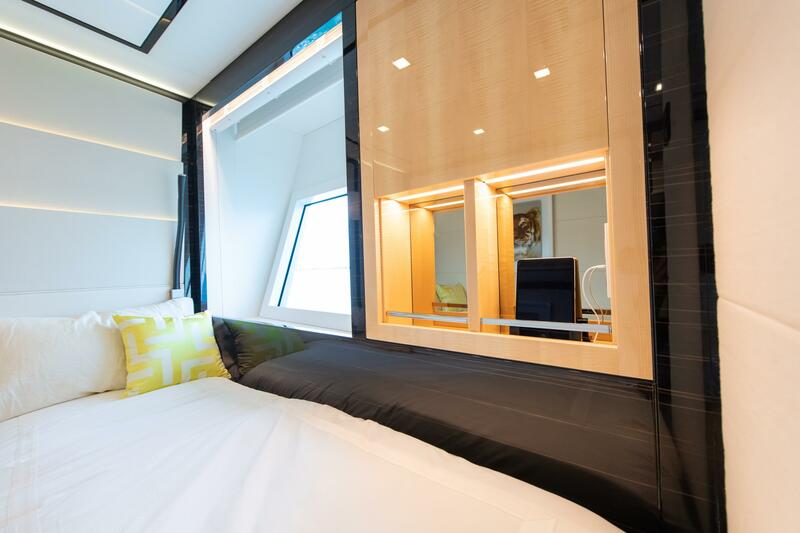 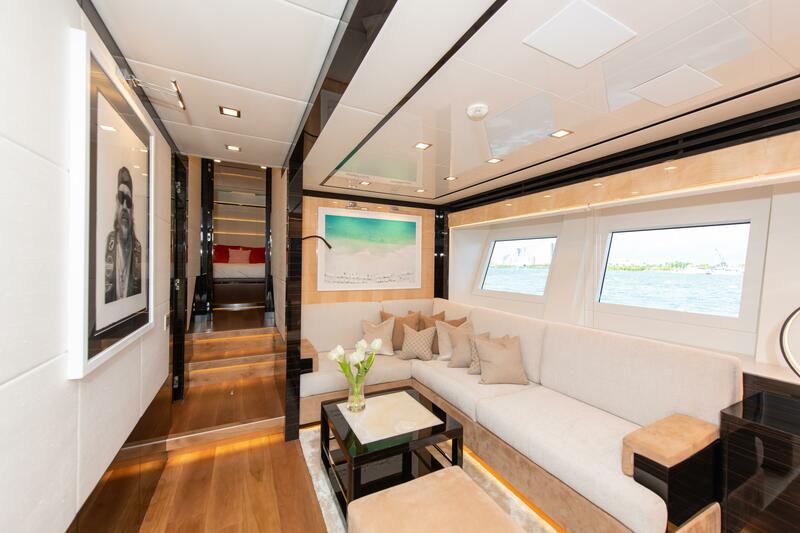 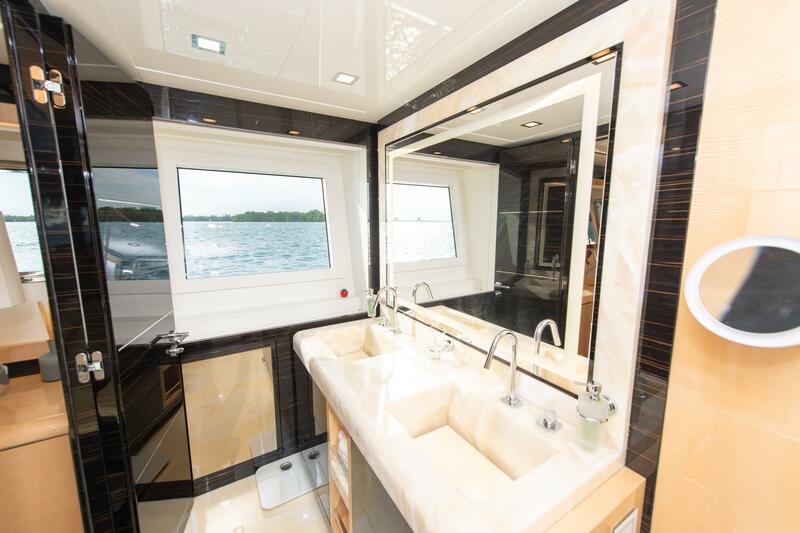 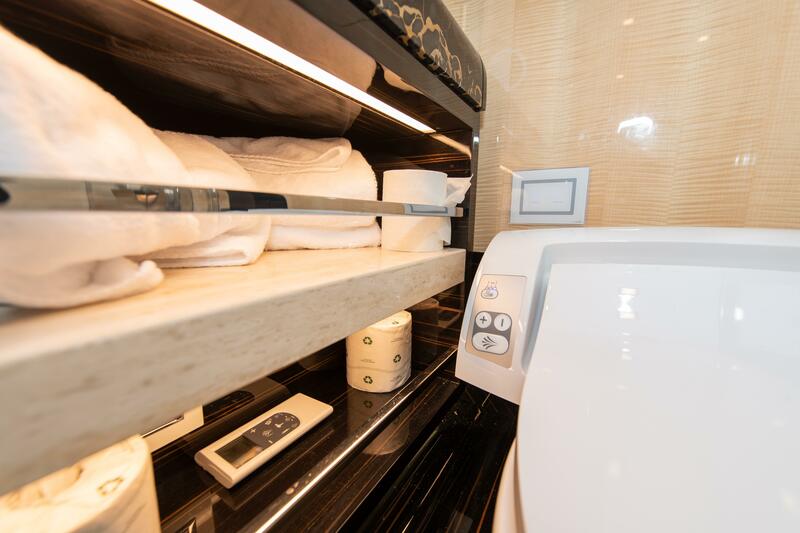 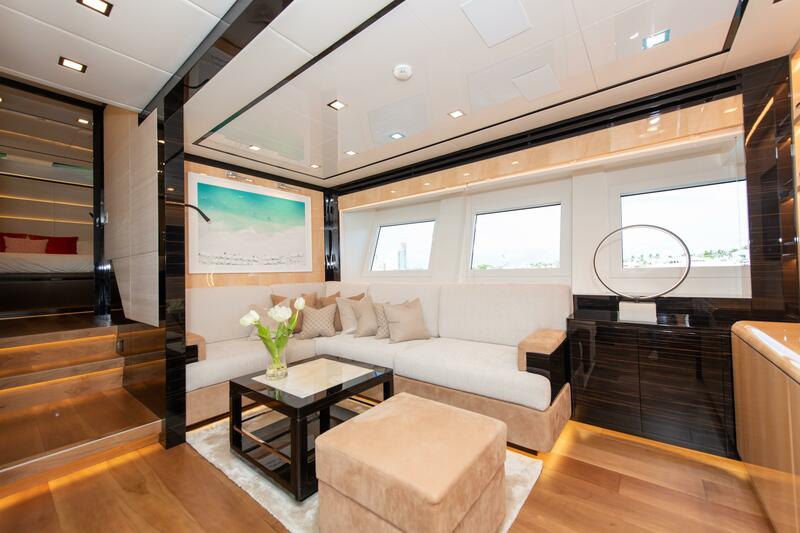 Natural light has been given primary importance onboard the yacht and streams in through the single glazing on the main deck and the huge windows in the lower deck salon and owner’s suite. 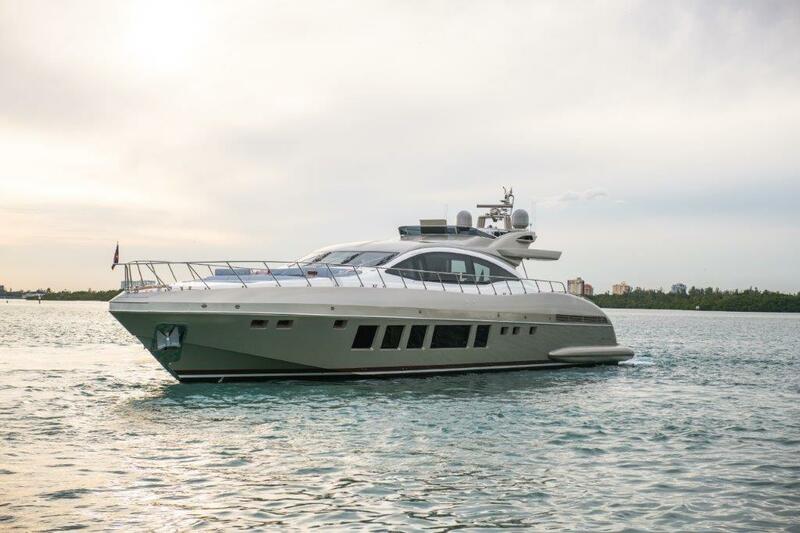 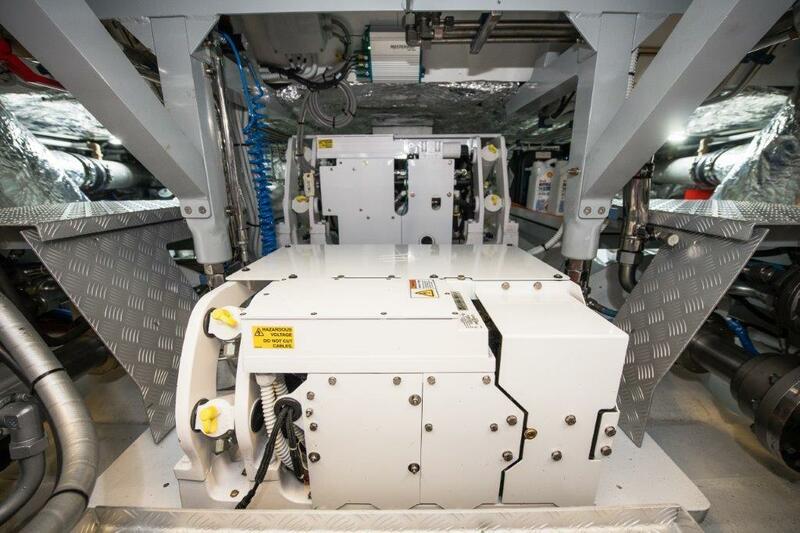 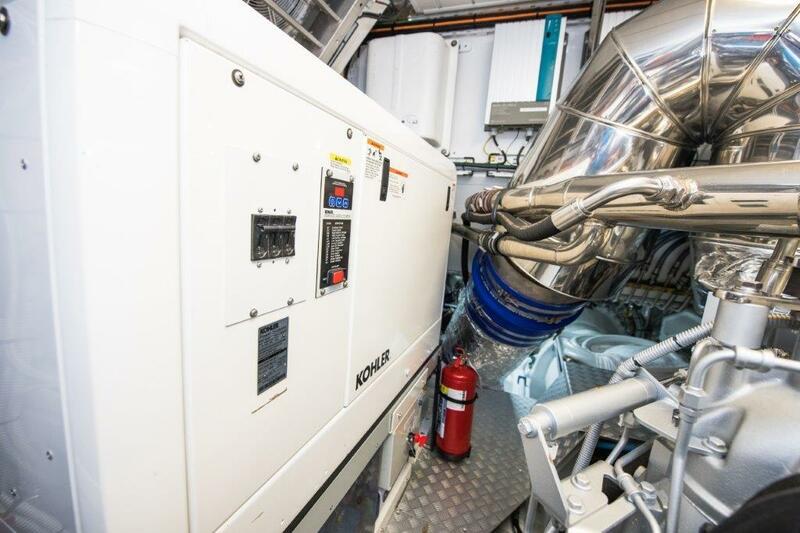 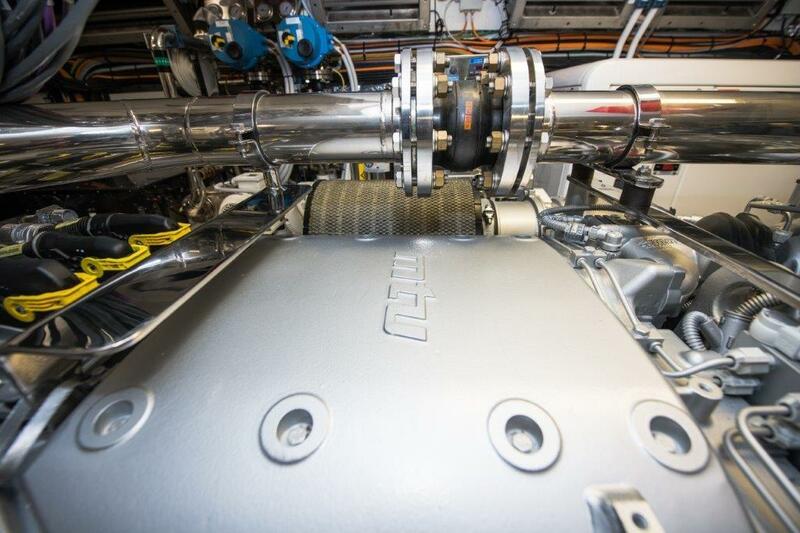 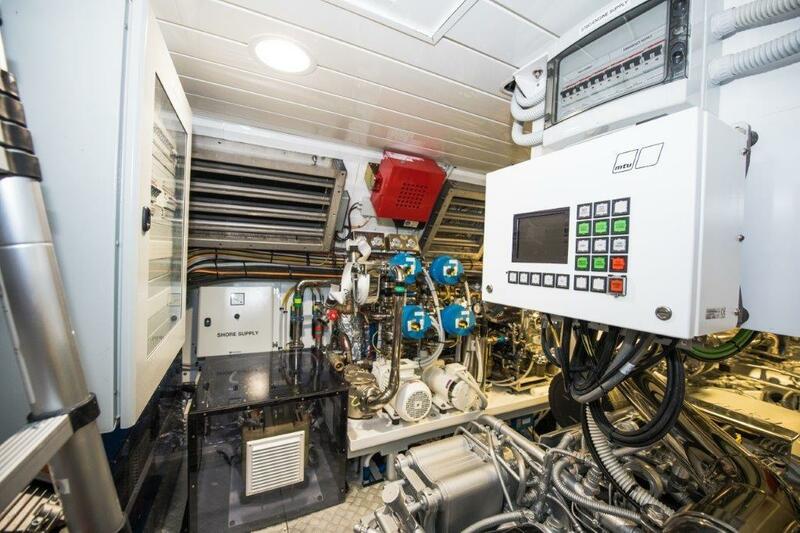 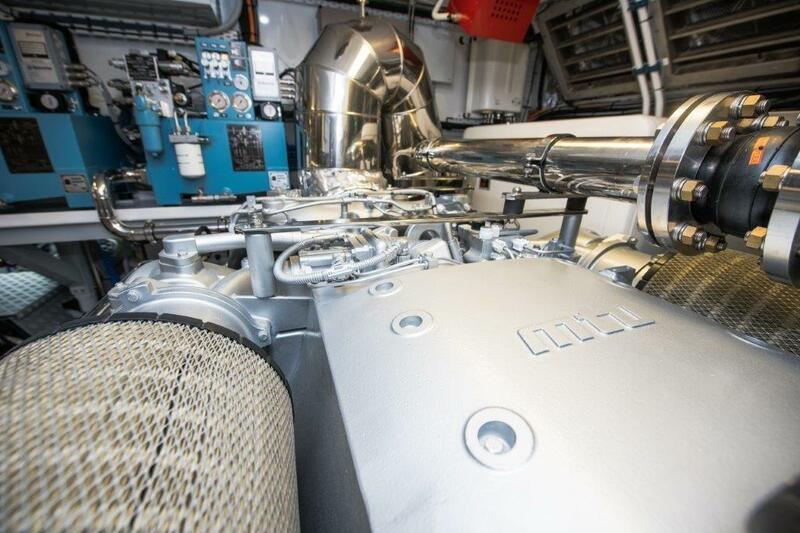 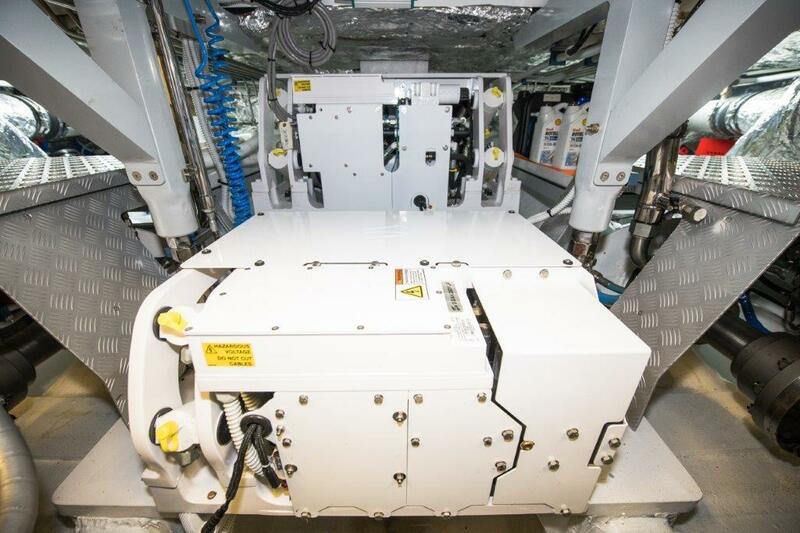 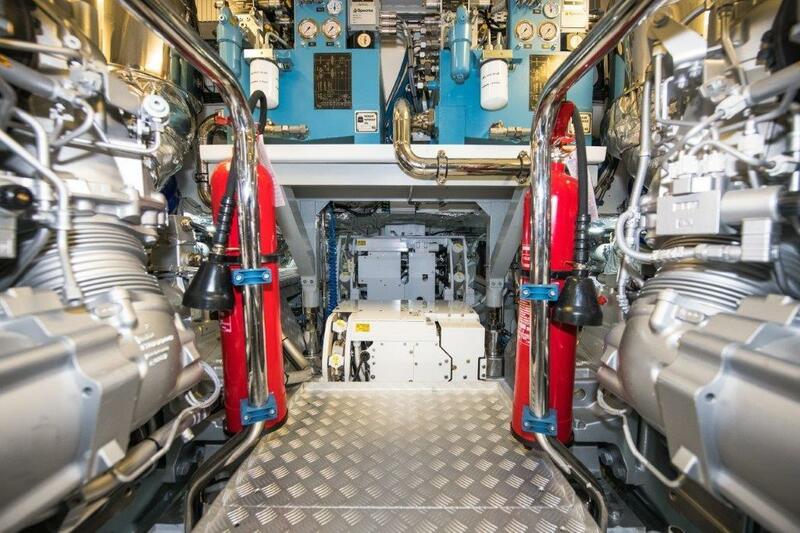 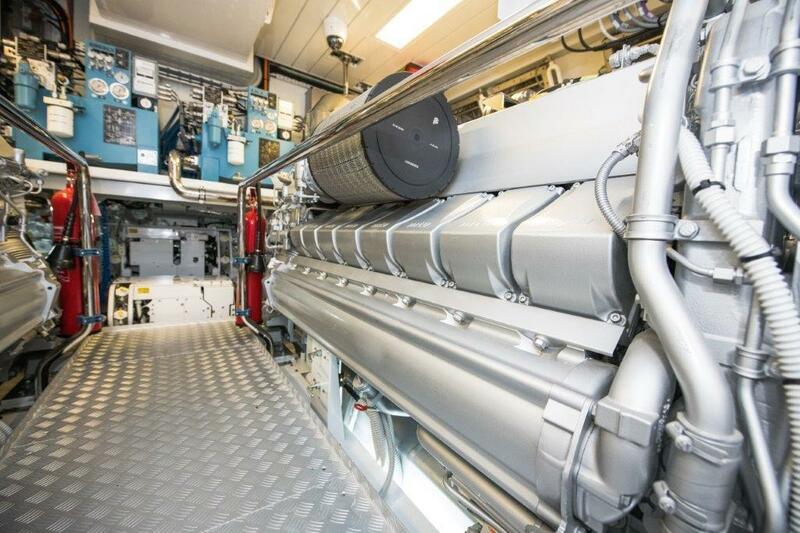 This 2019 MANGUSTA also features technical innovations; MTU 16V2000 M96 2600 HP engines, giving EXCELLENCE a top speed of 37 knots and installation of two gyroscopic stabilizer SEAKEEPER for slow and fast speed. 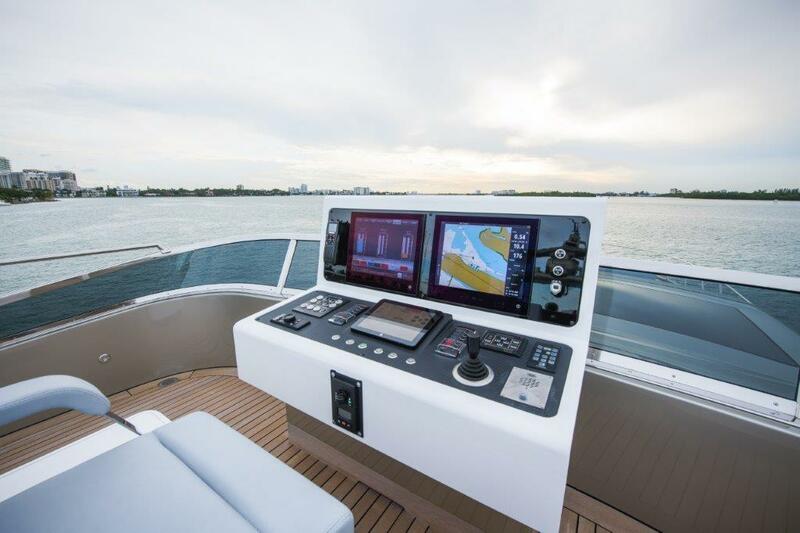 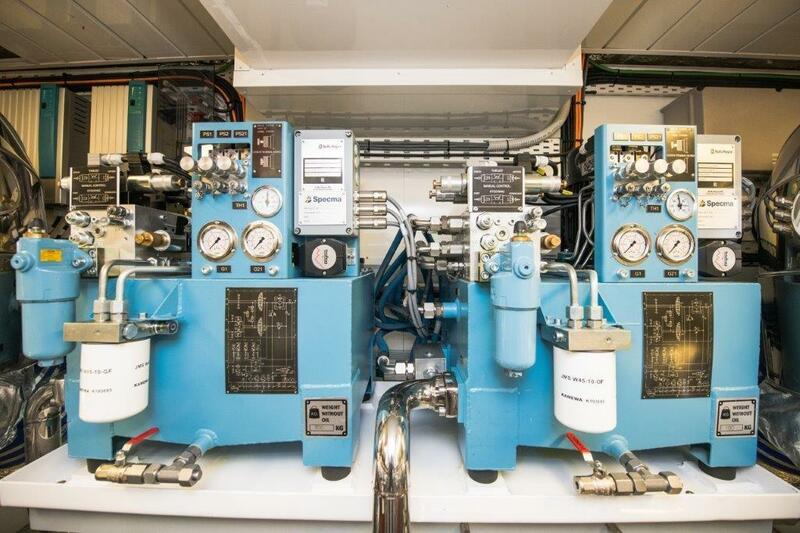 The latest Rolls Royce Kamewa Wj system is installed on this MAXI OPEN, featuring the new revolutionary electronics with joystick for easy maneuvering, and cruising up to full speed on a single touch, with the addition of the dynamic positioning feature, brand new technology able to maintain the yacht in a selected GPS position overcoming the effect of tide, wind and stream, by effectively combining direction and thrust. 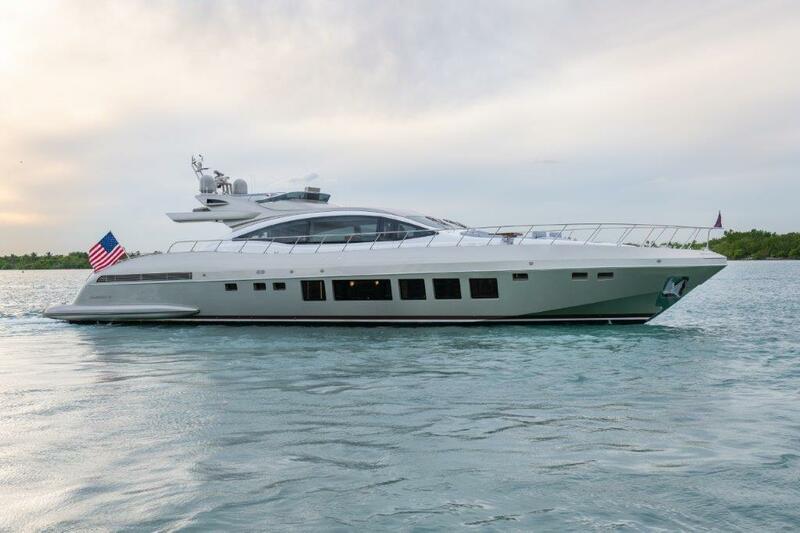 Don’t miss your opportunity to own 2019 MANGUSTA 94’ MAXI OPEN EXCELLENCE, a one-of-a-kind express yacht that will surely exceed your expectations. 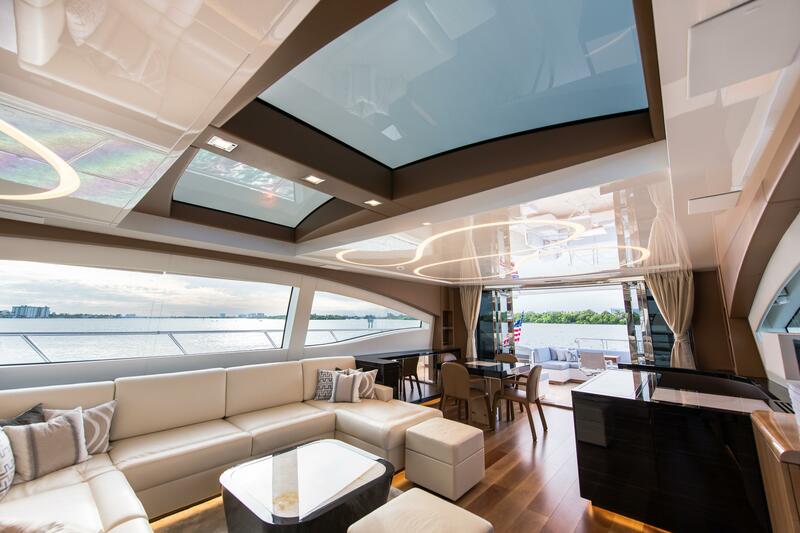 Custom Ceiling Windows with Electrically Operated Glass black out feature that turns glass from clear to clouded appearance.